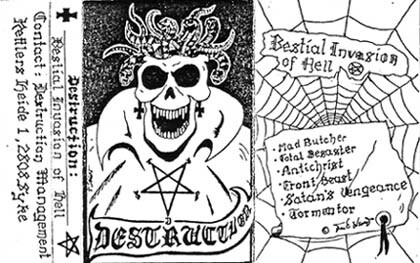 10/08/1984; 'Bestial Invasion Of Hell' demo released. 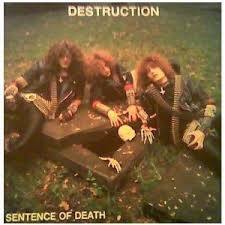 10/11/1984; 'Sentence Of Death' mini album released. 01/12/1984; Concert at Jugendhaus Emscher, Altenessen, Germany. 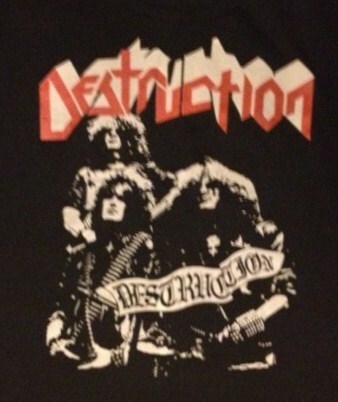 with Sodom & Iron Angel. 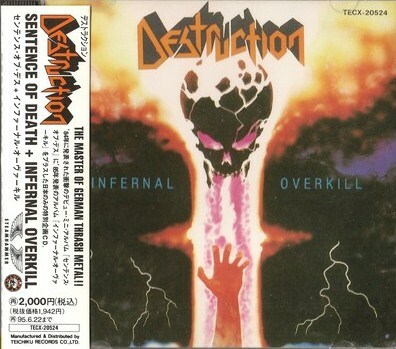 17/05/1985; 'Infernal Overkill' album released. 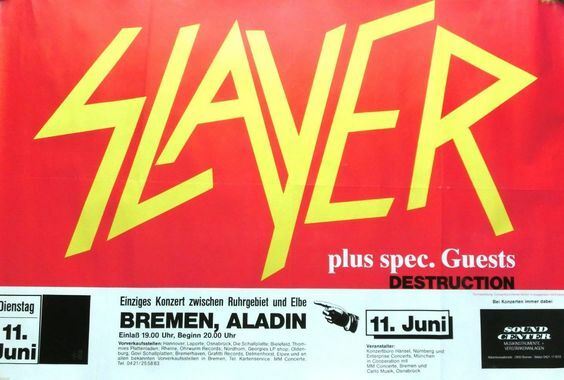 11/06/1985; Concert at Aladin, Bremen, Germany. opening for Slayer. 12/06/1985; Concert at Markthalle, Hamburg, Germany. opening for Slayer. 13/06/1985; Concert at Quartier Latin, Berlin, Germany. opening for Slayer. 14/06/1985; Concert at Rurersaal, Nurnberg, Germany. opening for Slayer. 16/06/1985; Concert at Rockfabric, Ludwigsberg, Germany. opening for Slayer. 17/06/1985; Concert at Alabamahalle, Munich, Germany. opening for Slayer. 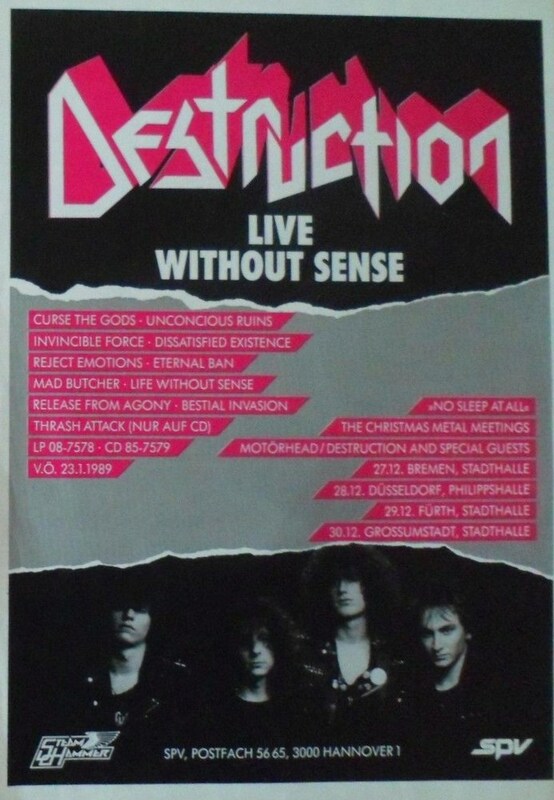 18/06/1985; Concert at Zeche, Bochum, Germany. opening for Slayer. 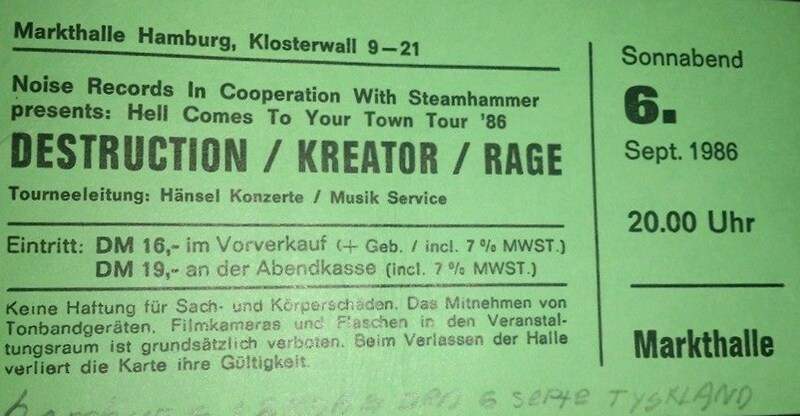 19/06/1985; Concert at Hugenottenhalle, Neu-Isenburg, Germany. opening for Slayer. 20/06/1985; Concert at Blue Moon Circus, Frankfurt, Germany. opening for Slayer. 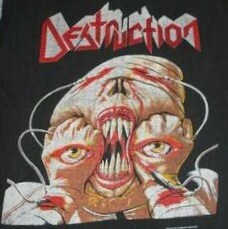 19/10/1985; Concert at Live Station, Dortmund, Germany. 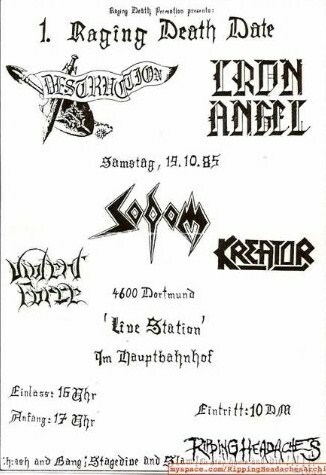 with Sodom, Iron Angel & Kreator. 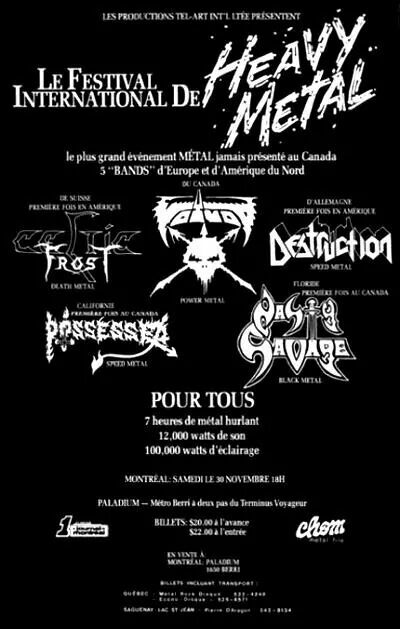 30/11/1985; Concert at The Paladium, Montreal, Canada. 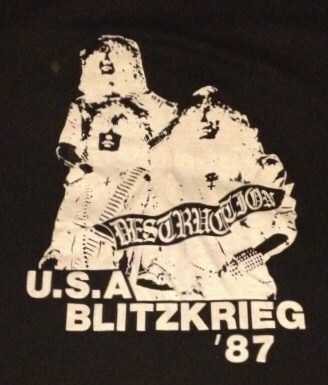 with Celtic Frost, Possessed, Voivod etc. 'World War III' festival. 03/12/1985; Concert at Le Moustache, Club, Montreal, Canada. 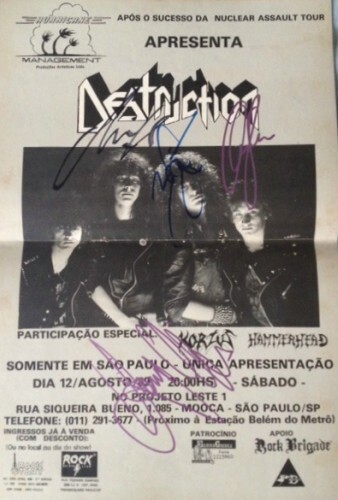 with Celtic Frost. (9:30 show). 03/12/1985; Concert at Le Moustache, Club, Montreal, Canada. with Celtic Frost. (11:30 show). 04/12/1985; Concert at Le Moustache, Club, Montreal, Canada. opening for Celtic Frost. (9:30 show). 04/12/1985; Concert at Le Moustache, Club, Montreal, Canada. opening for Celtic Frost. (11:30 show). 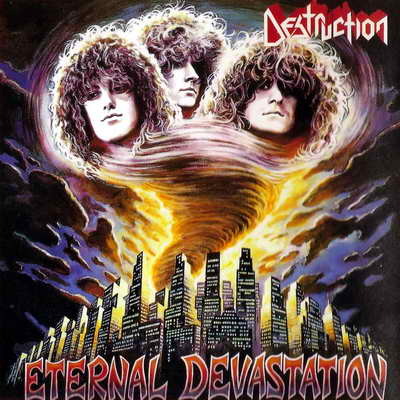 12/07/1986; 'Eternal Devastation' album released, also listed as 27/06 in US. 06/09/1986; Concert at The Markthalle, Hamburg, Germany. with Kreator & Rage. 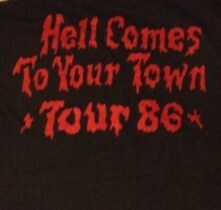 (Sep. 6th - 21st; 'Hell Comes To Your Town' tour). 07/09/1986; Concert at Quartier Latin, Berlin, Germany. 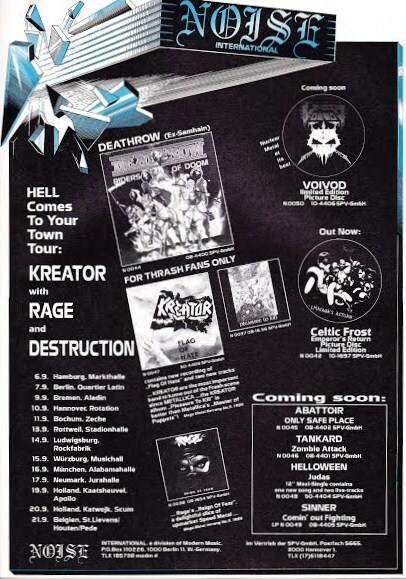 with Kreator & Rage. 09/09/1986; Concert at The Aladin, Bremen, Germany. with Kreator & Rage. 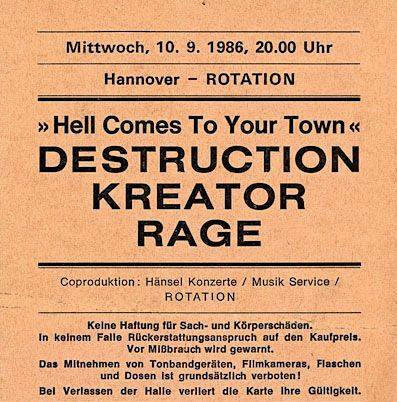 10/09/1986; Concert at Rotation, Hannover, Germany. with Kreator & Rage. 11/09/1986; Concert at Zeche, Bochum, Germany. with Kreator & Rage. 13/09/1986; Concert at Stadionhalle, Rottwell, Germany. 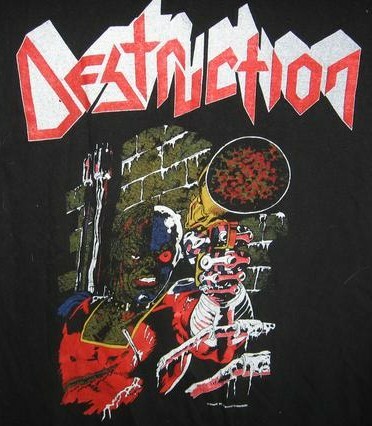 with Kreator & Rage. 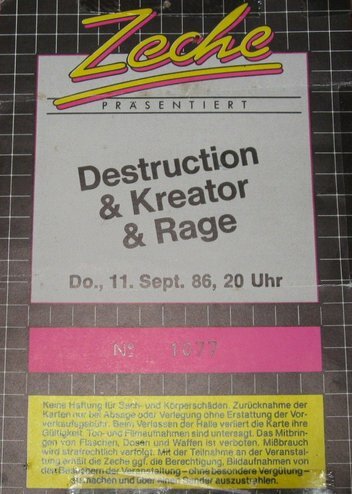 14/09/1986; Concert at Rockfabrik, Ludwigsberg, Germany. with Kreator & Rage. 15/09/1986; Concert at Musichall, Wurberg, Germany. with Kreator & Rage. 16/09/1986; Concert at Alabamahalle, Munich, Germany. 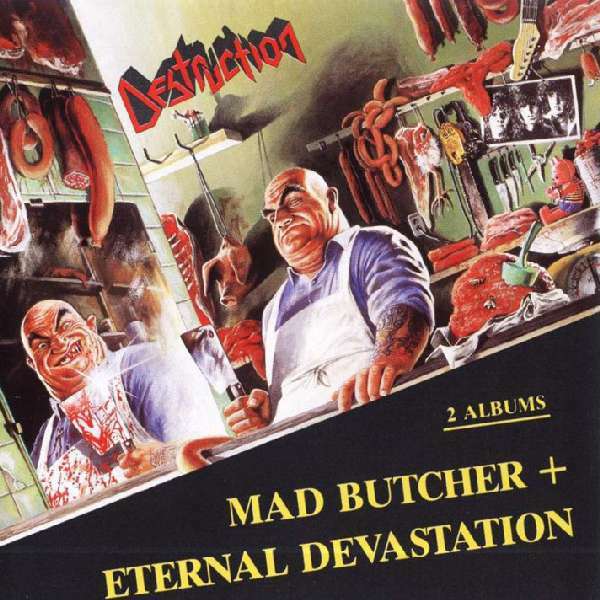 with Kreator & Rage. 17/09/1986; Concert at Jurahalle, Neumark, Germany. with Kreator & Rage. 19/09/1986; Concert at The Apollo, Kaatshevaul, The Netherlands. 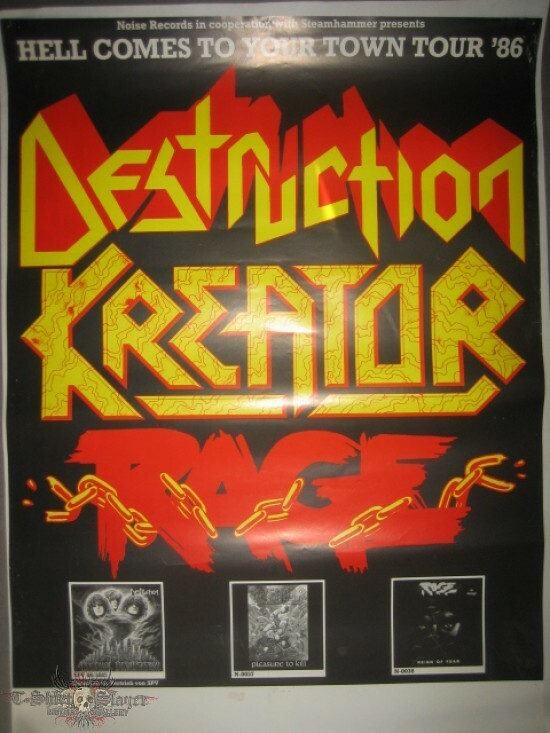 with Kreator & Rage. 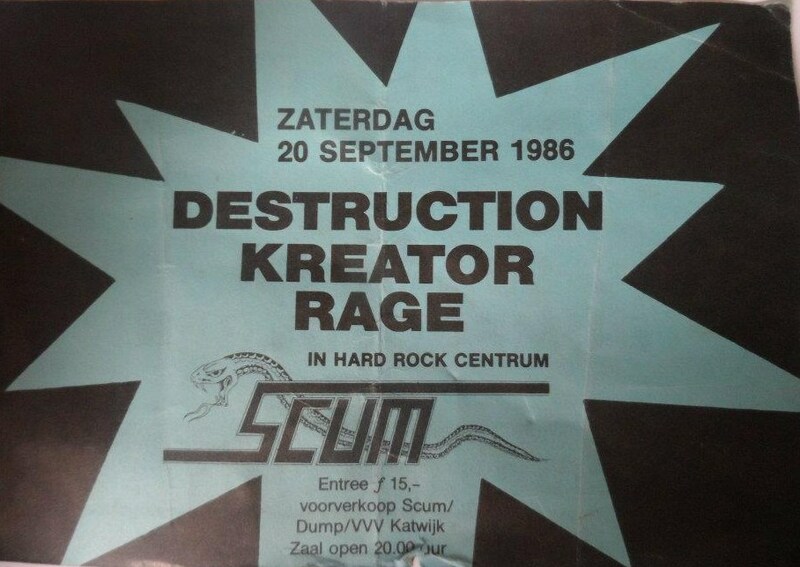 20/09/1986; Concert at Club Scum, Katwijk, The Netherlands. with Kreator & Rage. 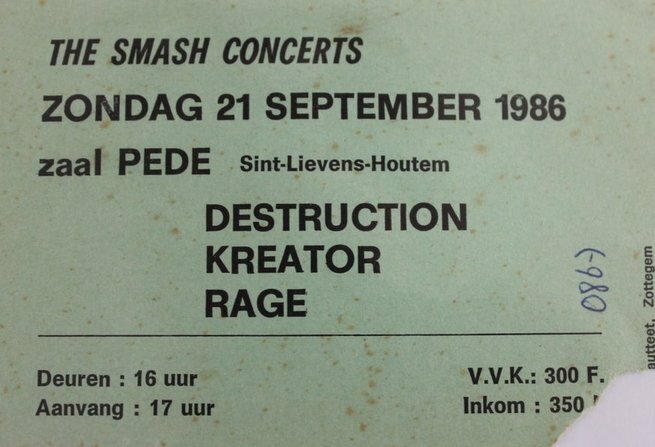 21/09/1986; Concert at Zaal Pede, St. Lievens-Houtem, Belgium. 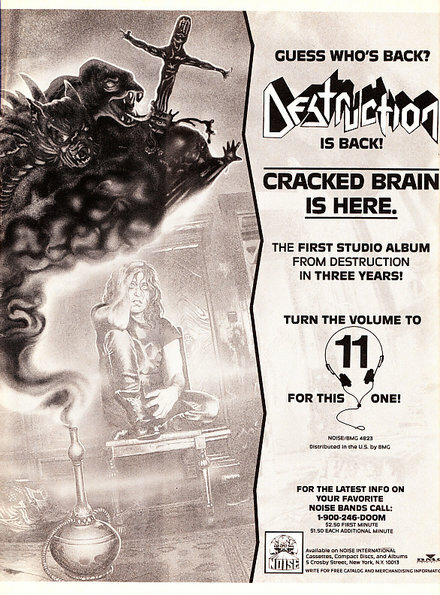 with Kreator & Rage. 31/01/1987; Concert at Turnhalle, Oberursel, Germany. 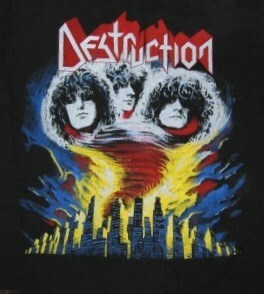 with Angel Dust & Tankard. 03/05/1987; Concert at Zeche, Bochum, Germany. 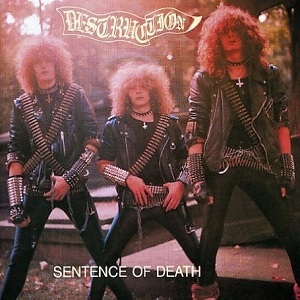 with Living Death & Darkness. 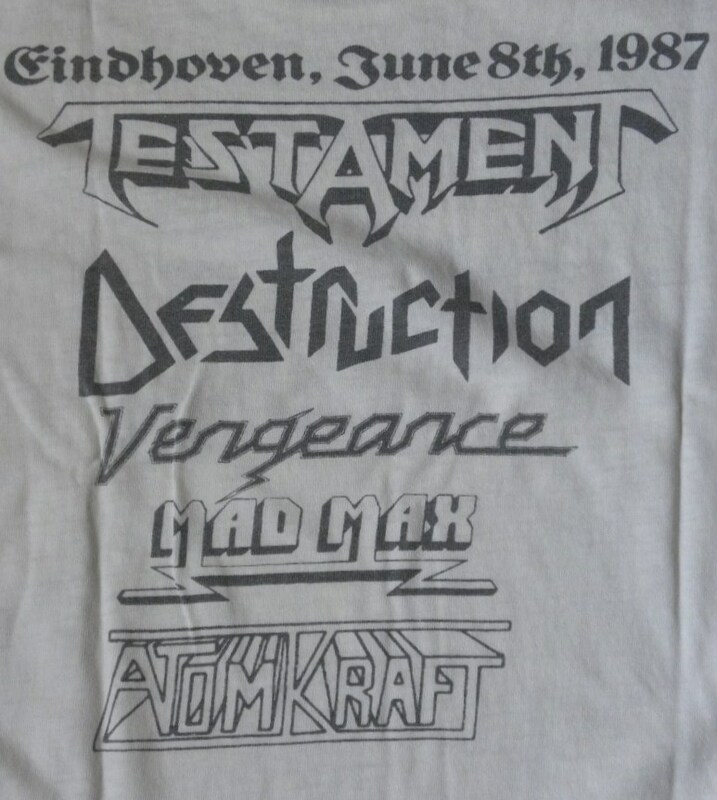 08/06/1987; Concert at The Dynamo, Eindhoven, The Netherlands. opening for Testament, with Asst. 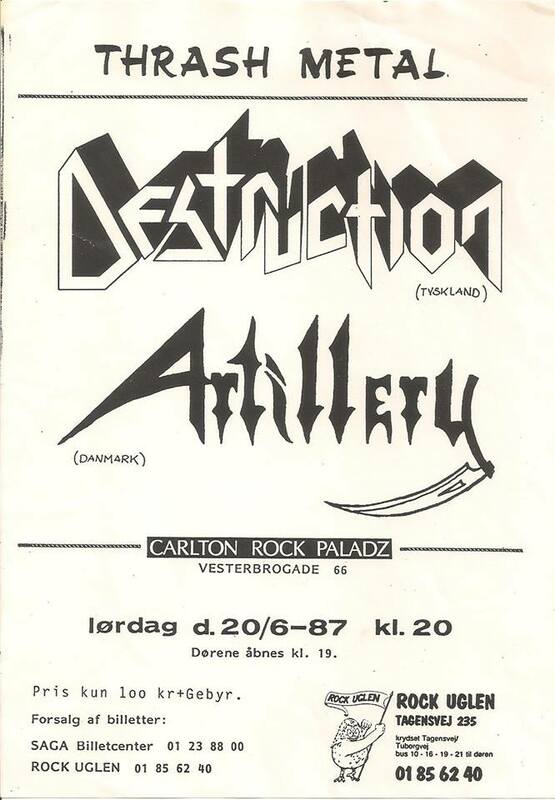 20/06/1987; Concert at Carlton Rock Paladz, Copenhagen, Denmark. with Artillery. 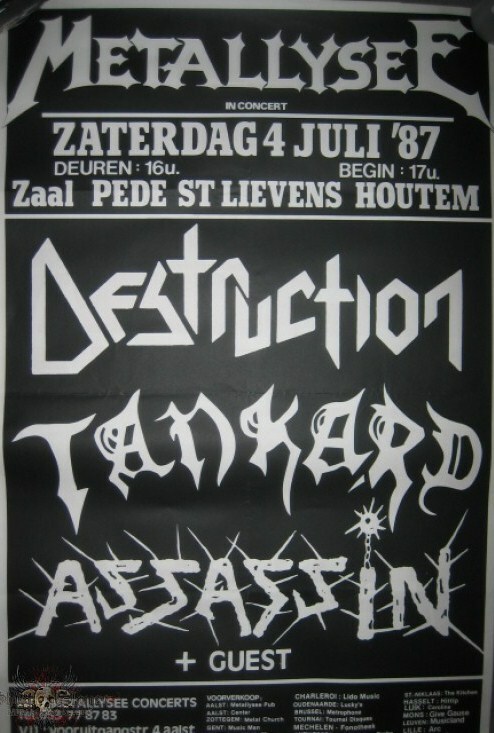 04/07/1987; Concert at Zaal Pede, Sint Lievens Houtem, Belgium. 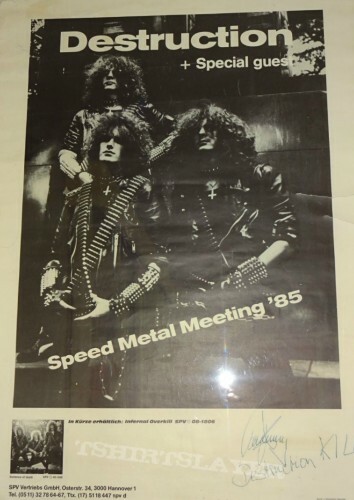 with Tankard & Assassin. 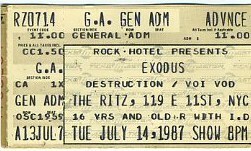 14/07/1987; Concert at The Ritz, New York City, NY, USA. 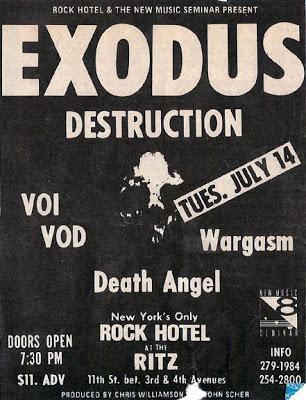 opening for Exodus, with Voivod, Wargasm & Death Angel. 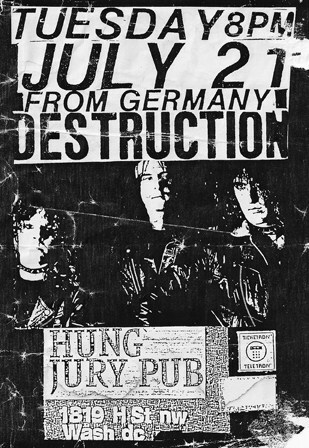 21/07/1987; Concert at The Hung Jury Pub, Washington, DC, USA. 23/07/1987; Concert at Blondie's, Detroit, MI, USA. 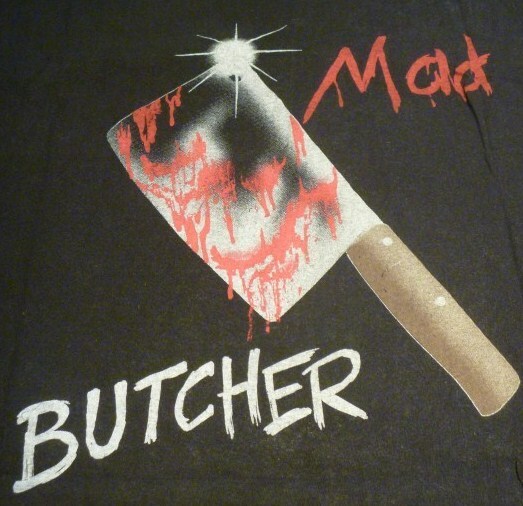 25/07/1987; 'Mad Butcher' mini album released. 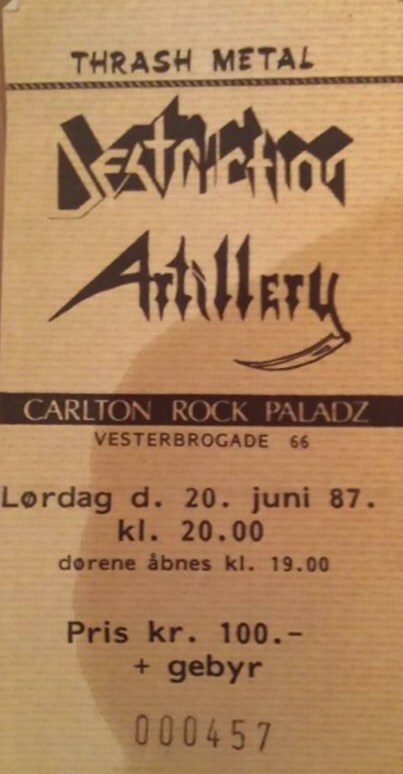 19/11/1987; Concert at Saga, Copenhagen, Denmark. (Nov. 19th - Dec. 18th; 'Release From Agony' tour). 21/11/1987; Concert at Noorderligt, Tilburg, The Netherlands. opening for Motorhead & King Diamond. 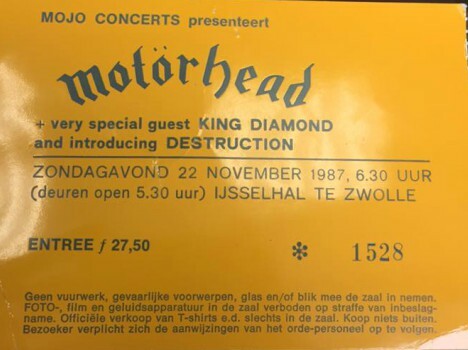 22/11/1987; Concert at Ijssehall, Zwolle, The Netherlands. opening for Motorhead & King Diamond. 23/11/1987; Concert at Vooruit, Gent, Belgium. opening for Motorhead & King Diamond. 24/11/1987; Concert at Hof Ter Lo, Antwerpen, Belgium. opening for Motorhead & King Diamond. 25/11/1987; Concert at Kardigasthalle, Altendunstadt, Germany. opening for Motorhead & King Diamond. 27/11/1987; Concert at Kurhalle Oberlaa, Vienna, Austria. opening for Motorhead & King Diamond. 28/11/1987; Concert at Schwabenhalle, Donauworth, Germany. opening for Motorhead & King Diamond. 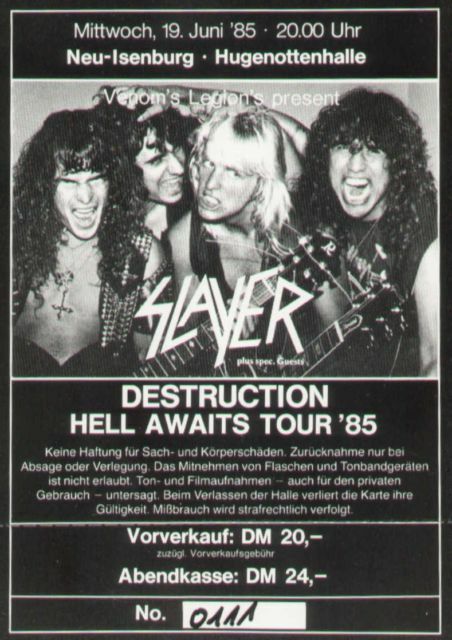 29/11/1987; Concert at Jovel Music Hall, Munster, Germany. opening for Motorhead & King Diamond. 30/11/1987; Concert at Messehalle, Kassel, Germany. opening for Motorhead & King Diamond. 02/12/1987; Concert at Rock Fabrik, Ludwigsberg, Germany. opening for Motorhead & King Diamond. 03/12/1987; Concert at Alabamahalle, Munich, Germany. opening for Motorhead & King Diamond. 04/12/1987; Concert at Gartenschauhalle, Schwablach, Germany. opening for Motorhead & King Diamond. 05/12/1987; Concert at Neumarkt Jurahalle, Nurnberg, Germany. opening for Motorhead & King Diamond. 06/12/1987; Concert at The Pink Palace, Essen, Germany. opening for Motorhead & King Diamond. 08/12/1987; Concert at Stadhalle, Loerrach, Germany. opening for Motorhead & King Diamond. 09/12/1987; Concert at Stadhalle, Offenbach, Germany. opening for Motorhead & King Diamond. 10/12/1987; Concert at Gartenhalle, Karlsrhue, Germany. opening for Motorhead & King Diamond. 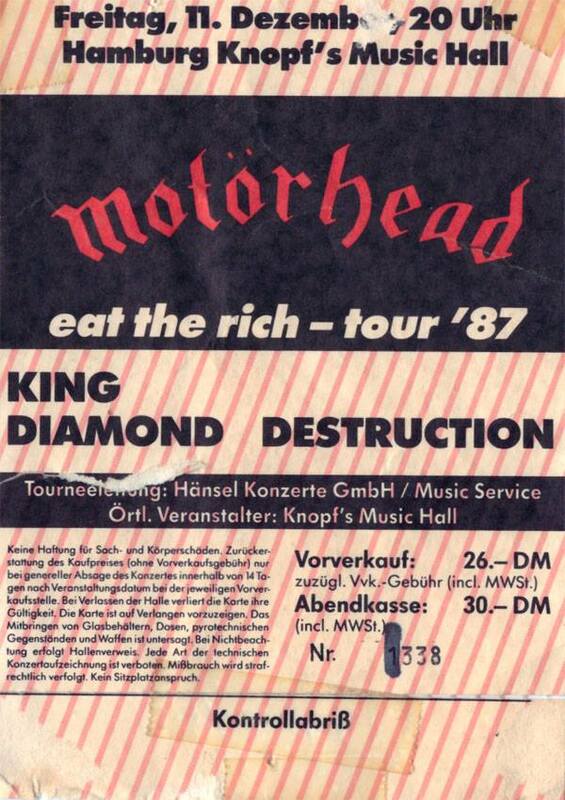 11/12/1987; Concert at Knopf's Music Hall, Hamburg, Germany. opening for Motorhead & King Diamond. 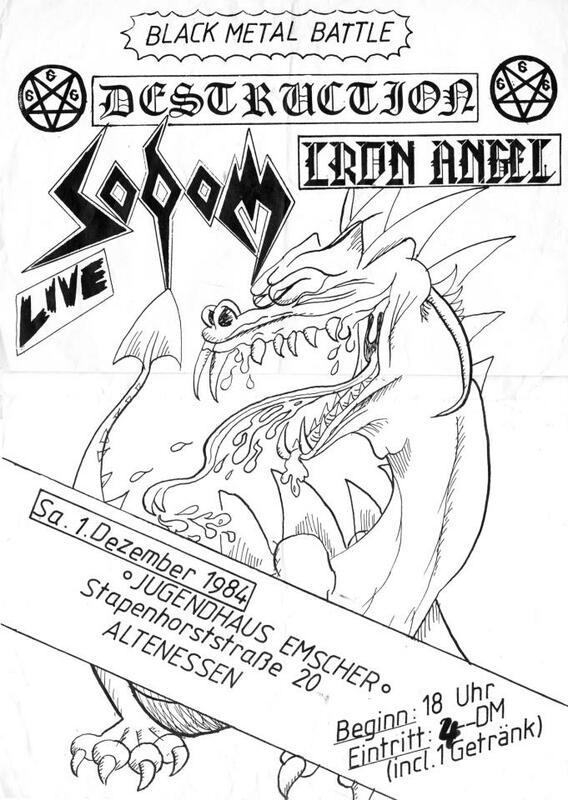 12/12/1987; Concert at Stadhalle, Emden, Germany. opening for Motorhead & King Diamond. 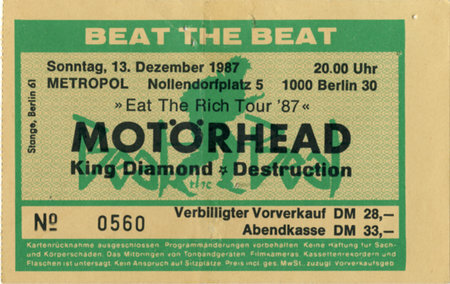 13/12/1987; Concert at The Metropol, Berlin, Germany. opening for Motorhead & King Diamond. 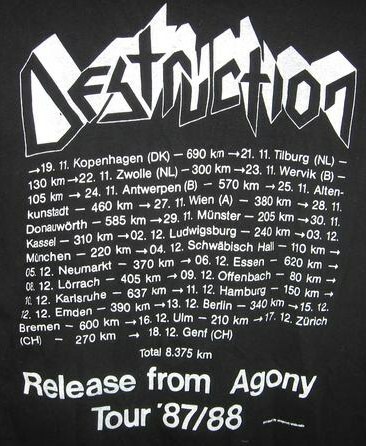 15/12/1987; Concert at Stadhalle, Bremen, Germany. opening for Motorhead & King Diamond. 16/12/1987; Concert at Sporthalle, Ulm, Germany. opening for Motorhead & King Diamond. 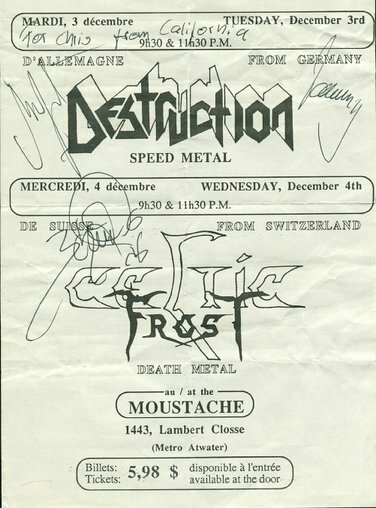 17/12/1987; Concert at Volkshaus, Zurich, Switzerland. opening for Motorhead & King Diamond. 18/12/1987; Concert at Palais Des Sports, Genf, Switzerland. opening for Motorhead. 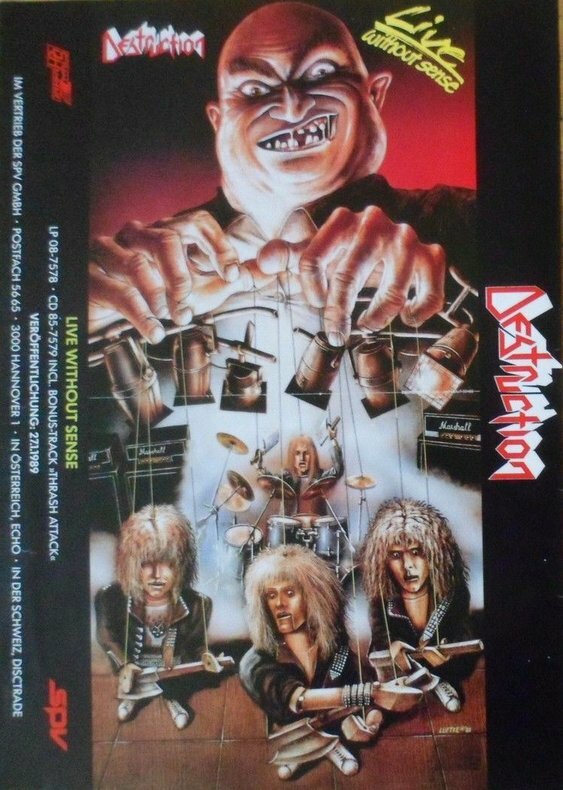 21/12/1987; Concert at Le Zenith, Paris, France. opening for Motorhead. 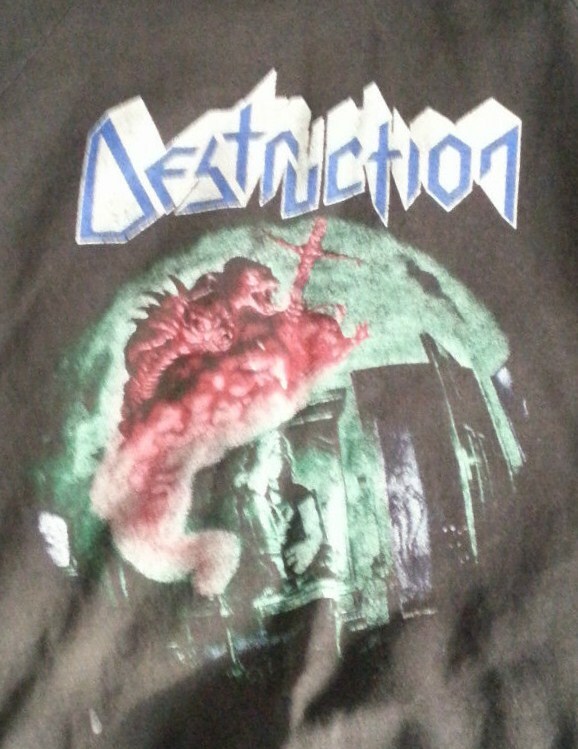 23/12/1987; Concert at Hammersmith Odeon, London, England. opening for Motorhead, with Wolfsbane. 18/03/1988; Concert at Stadhalle, Deggendorf, Germany. 19/03/1988; Concert at Onoldiasaal, Ansbach, Germany. 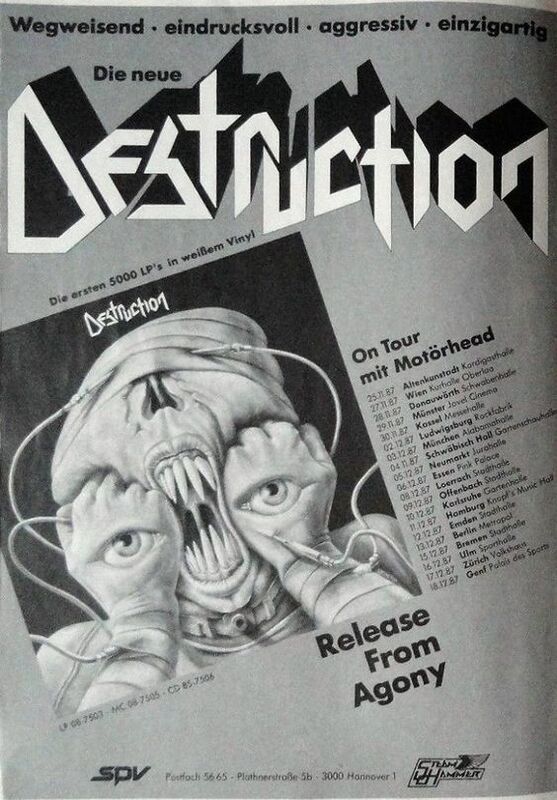 20/03/1988; Concert at Scheffelhalle, Singen, Germany. 23/03/1988; Concert at Theatre De Verdue, Nice, France. opening for Motorhead & Girlschool. 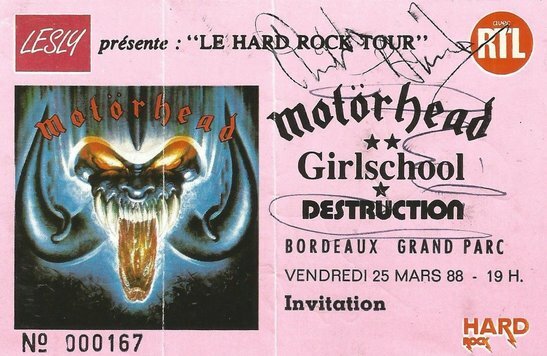 24/03/1988; Concert at The Rockstore, Montpellier, France. opening for Motorhead & Girlschool. 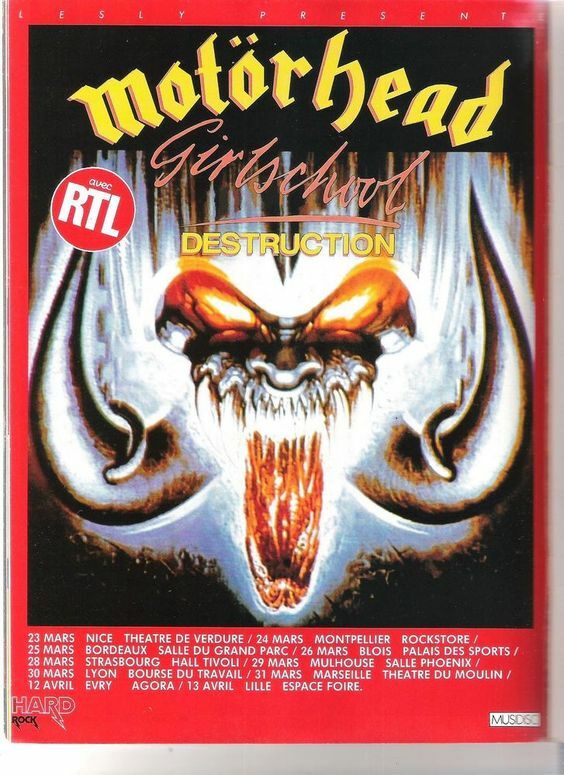 25/03/1988; Concert at Salle Du Grand Parc, Bordeaux, France. opening for Motorhead & Girlschool. 26/03/1988; Concert at Palais Des Sports, Blois, France. opening for Motorhead & Girlschool. 28/03/1988; Concert at Hall Tivoli, Strasburg, France. opening for Motorhead & Girlschool. 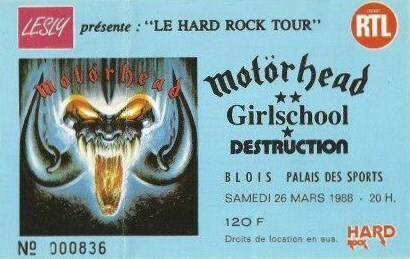 29/03/1988; Concert at Salle Phoenix, Mulhouse, France. opening for Motorhead & Girlschool. 30/03/1988; Concert at Bourse Du Travail, Lyon, France. opening for Motorhead & Girlschool. 31/03/1988; Concert at Theatre Du Moulin, Marseille, France. opening for Motorhead & Girlschool. 03/04/1988; Concert at Cascais, Lisbon, Spain. opening for Motorhead & Girlschool. 04/04/1988; Concert at Clube Infante De Sagpes, Porto, Spain. opening for Motorhead. 06/04/1988; Concert at Pabellon Deportivo, Real Madrid, Spain. opening for Motorhead & Girlschool. 08/04/1988; Concert at Pabellon Del Deportes Fuente, Valenica, Spain. opening for Motorhead. 09/04/1988; Concert at Palacio Municipal Deportes, Montjuic, Spain. opening for Motorhead & Girlschool. 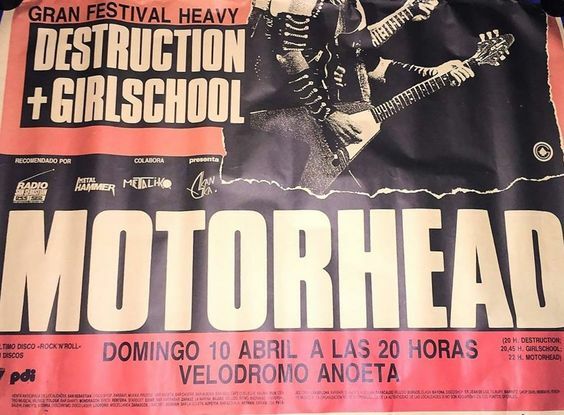 10/04/1988; Concert at Velodromo Anoeta, San Sebastian, Spain. opening for Motorhead & Girlschool. 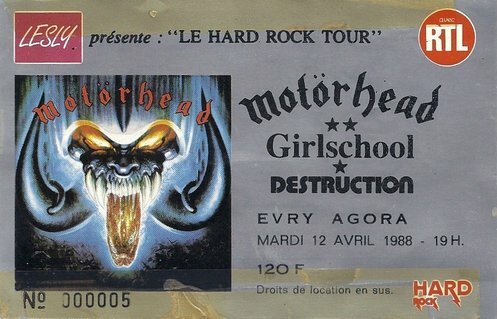 12/04/1988; Concert at The Agora, Evry, France. opening for Motorhead & Girlschool. 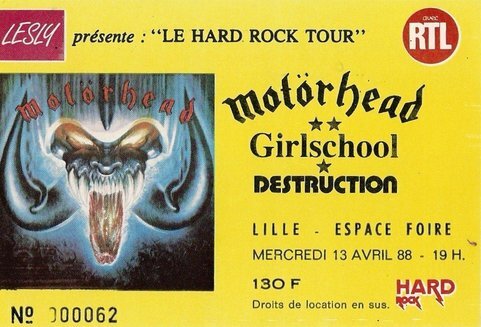 13/04/1988; Concert at Espace Foire, Lille, France. opening for Motorhead & Girlschool. 28/05/1988; Concert at Eissporthalle Braunschweig, Germany. 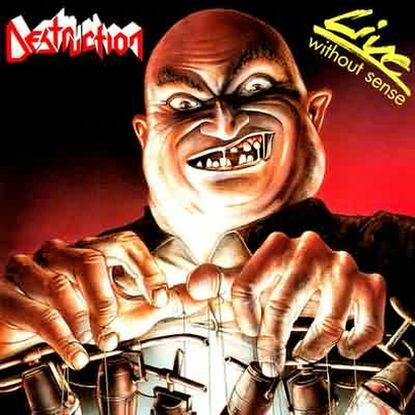 with Sodom, Tankard & Rage. 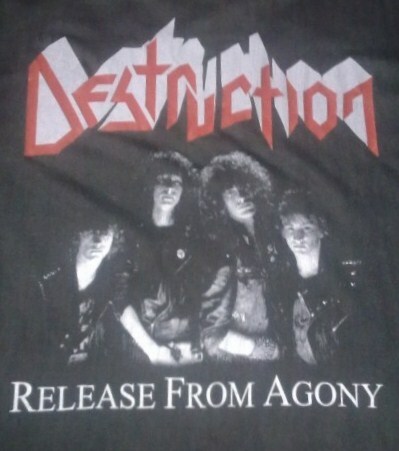 30/05/1988; 'Release From Agony' album released. 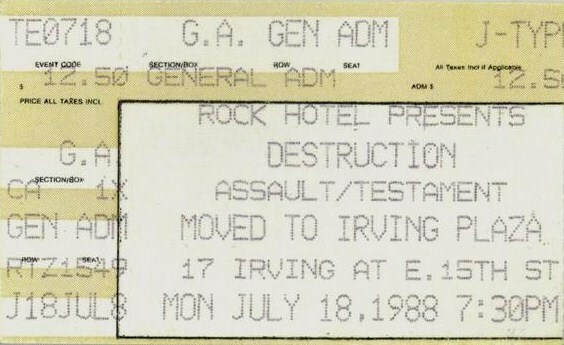 18/07/1988; Concert at Irving Plaza, New York, NY, USA. 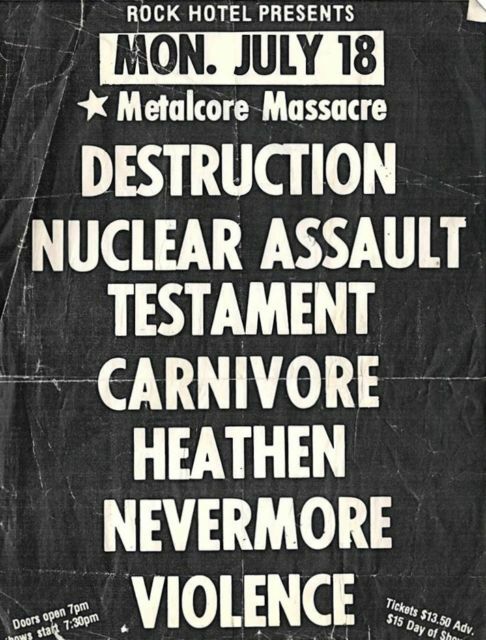 with Testament & Nuclear Assault, Carnivore etc..
19/07/1988; Concert at The Bayou, Washington, DC, USA. opening for Flotsam & Jetsam. 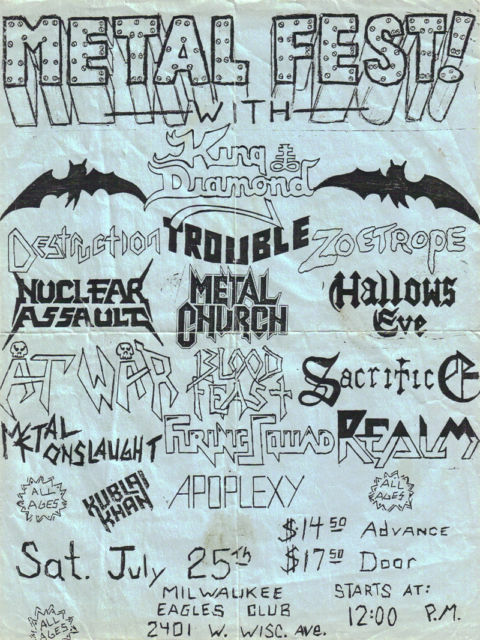 20/07/1988; Concert at The Anthrax, Norwalk, CT, USA. 21/07/1988; Concert at The Lost Horizon, Syracuse, NY, USA. 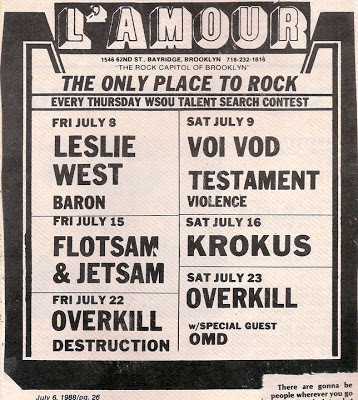 22/07/1988; Concert at L'Amour, Brooklyn, NY, USA. 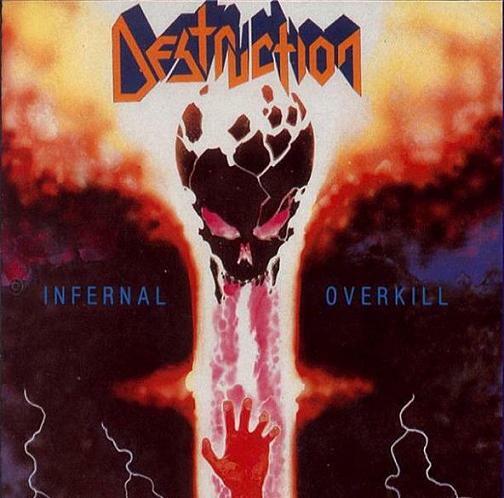 opening for Overkill. 22/09/1988; Concert at Fritz, Vienna, Austria. 23/09/1988; Concert at Fritz, Vienna, Austria. 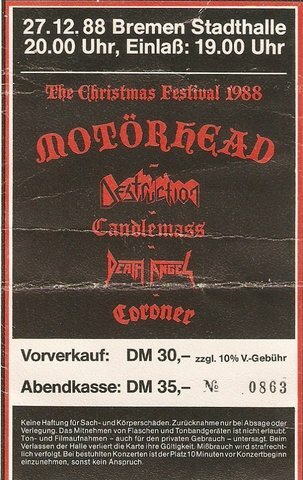 27/12/1988; Concert at Stadhalle, Bremen, Germany. 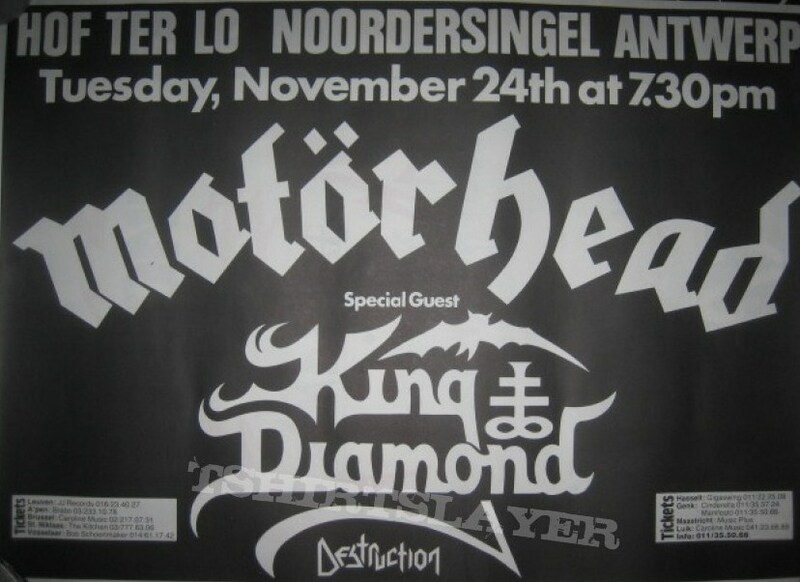 opening for Motorhead, with Sacred Reich, Coroner & Candlemass. 28/12/1988; Concert at Philipshalle, Dusseldorf, Germany. 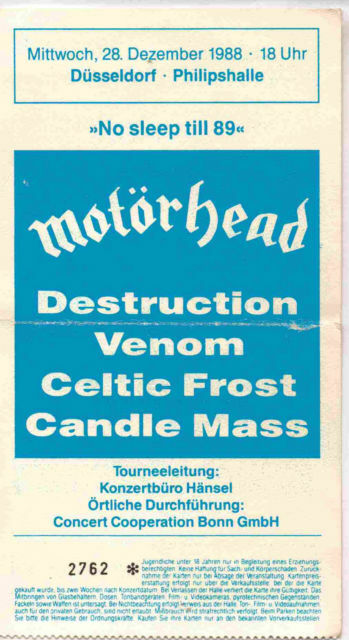 opening for Motorhead, with Sacred Reich, Venom, Coroner & Candlemass. 29/12/1988; Concert at Stadhalle, Furth, Germany. opening for Motorhead, with Sacred Reich, Coroner & Candlemass. 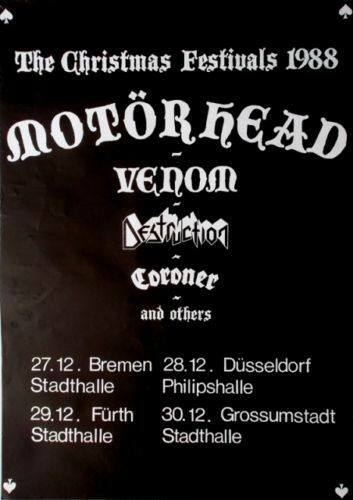 30/12/1988; Concert at Stadhalle, Gross Uumstadt, Germany. opening for Motorhead, with Sacred Reich, Coroner & Candlemass. ??/? 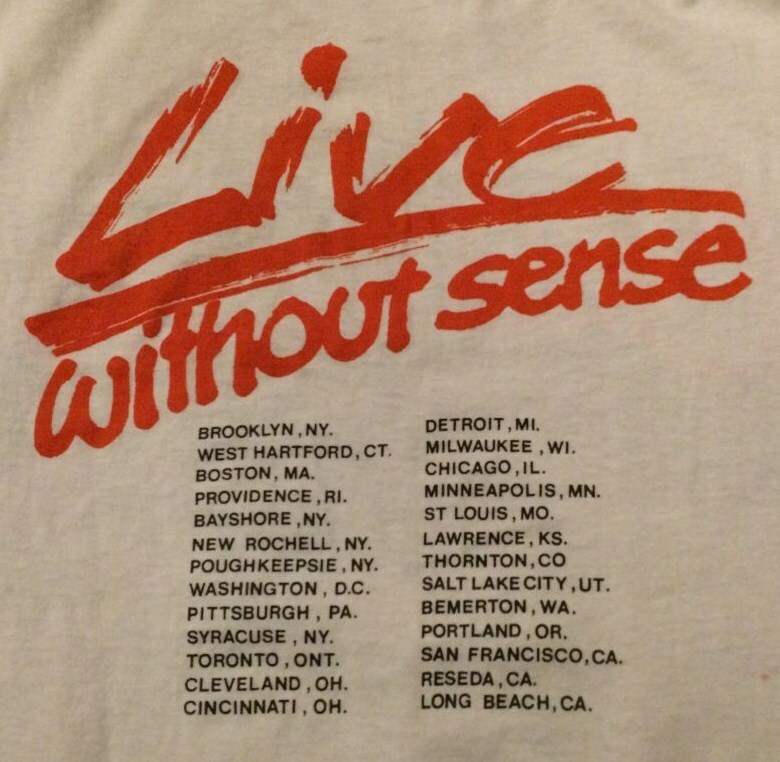 ?/1989; 'Live Without Sense' live album released. 24/02/1989; Concert at The Playhouse, Edinburgh, Scotland. 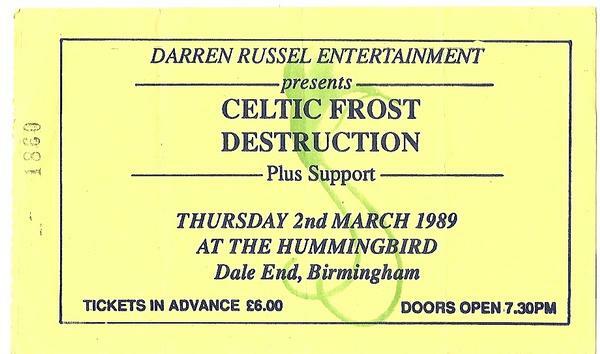 opening for Celtic Frost. 25/02/1989; Concert at The Royal Court Theatre, Liverpool, England. 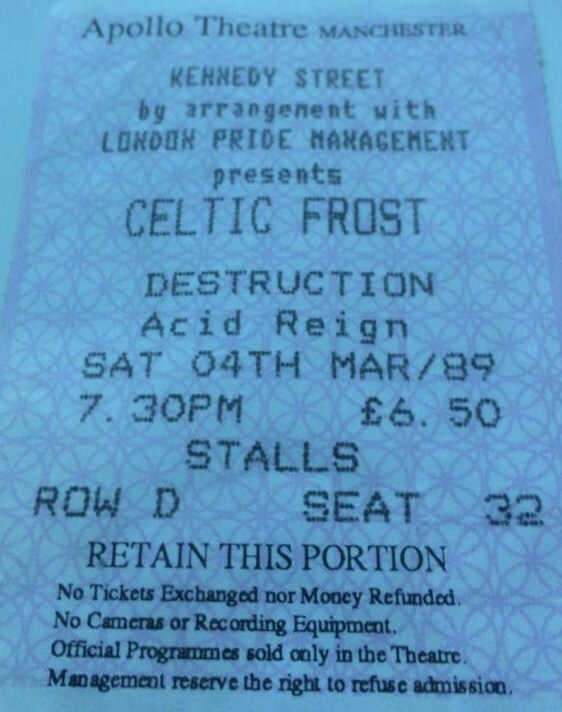 opening for Celtic Frost, with Acid Reign. (A.R. dropped from the bill). 26/02/1989; Concert at Queens Hall, Bradford, England. opening for Celtic Frost. 27/02/1989; Concert at Top Rank, Brighton, England. 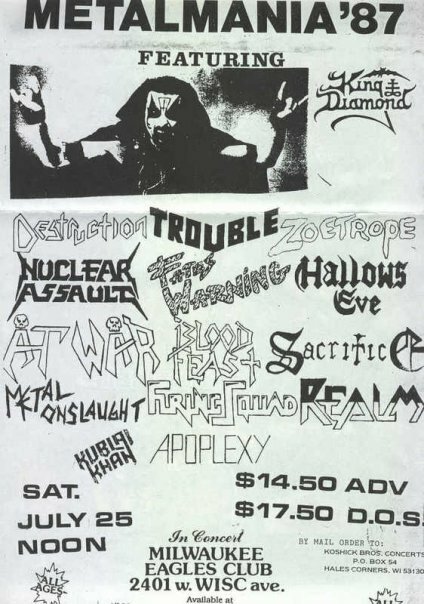 opening for Celtic Frost. 01/03/1989; Concert at Leas Cliff Hall, Folkstone, England. 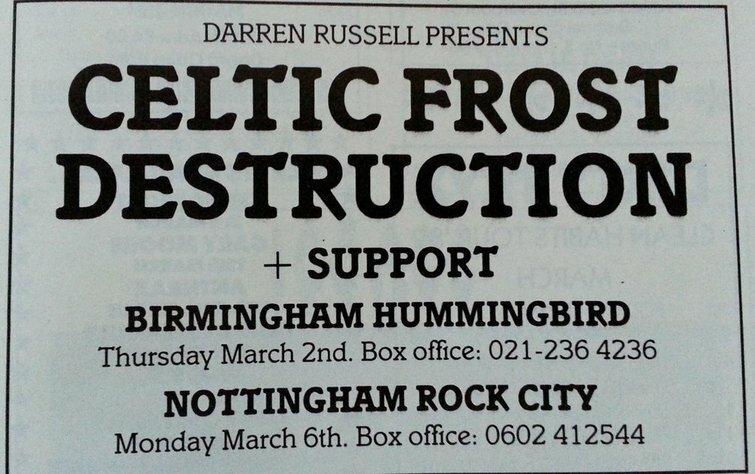 opening for Celtic Frost. 02/03/1989; Concert at The Hummingbird, Birmingham, England. opening for Celtic Frost. 03/03/1989; Concert at The Hammersmith Odeon, London, England. opening for Celtic Frost. 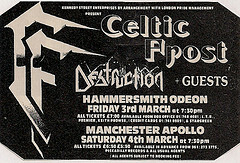 04/03/1989; Concert at The Manchester Apollo, Manchester, England. 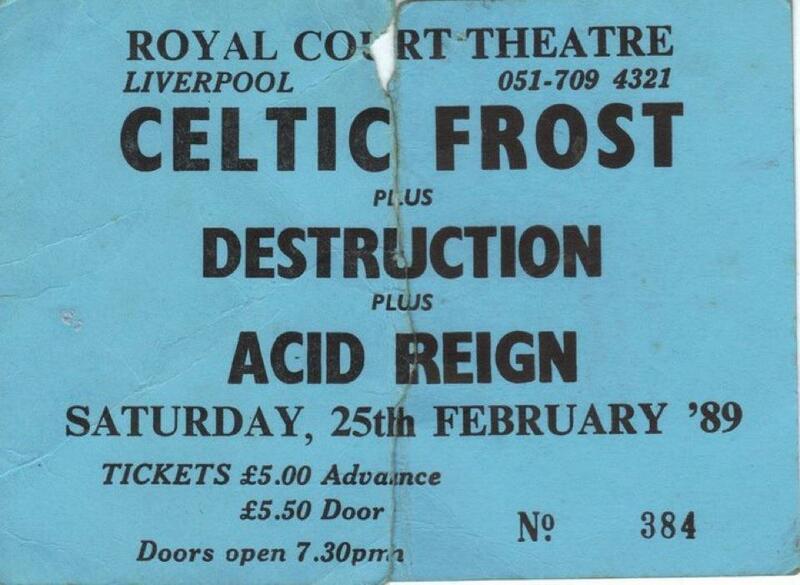 opening for Celtic Frost, with Acid Reign. (A.R. dropped from the bill). 05/03/1989; Concert at The Mayfair, Newcastle, England. opening for Celtic Frost. 06/03/1989; Concert at Nottingham Rock City, Nottingham, England. opening for Celtic Frost. 31/03/1989; Concert at Harpo's, Detroit, MI, USA. 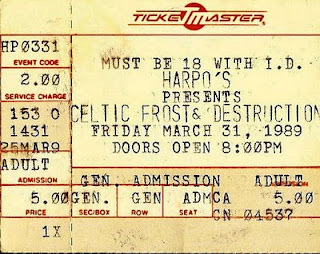 opening for Celtic Frost. 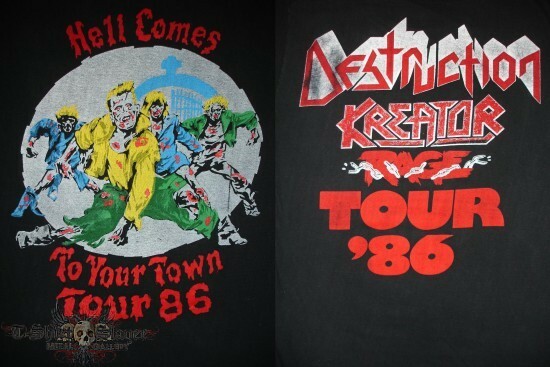 15/04/1989; Concert at West Hartford Arena, West Hartford, CT, USA. 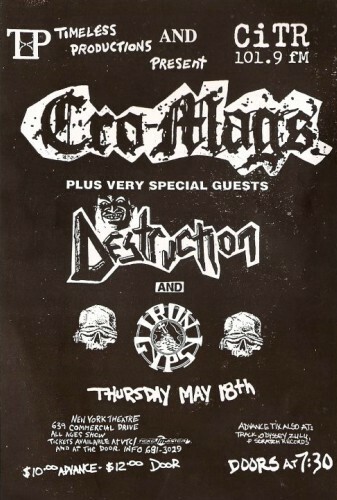 opening for Cro-Mags, with Wargasm. 19/04/1989; Concert at The Paradise, Boston, MA, USA. 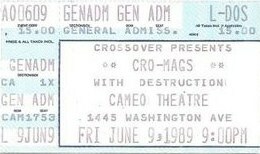 opening for Cro-Mags. 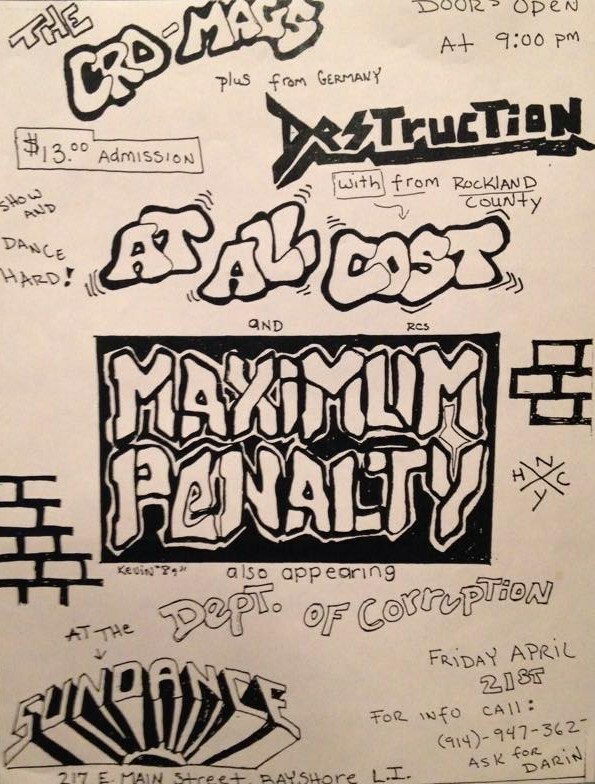 20/04/1989; Concert at The Living Room, Providence, RI, USA. 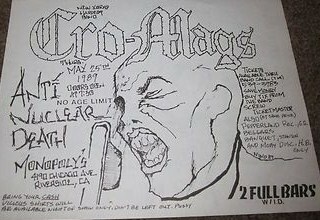 opening for Cro-Mags. 21/04/1989; Concert at The Sundance, Bayshore, NY, USA. 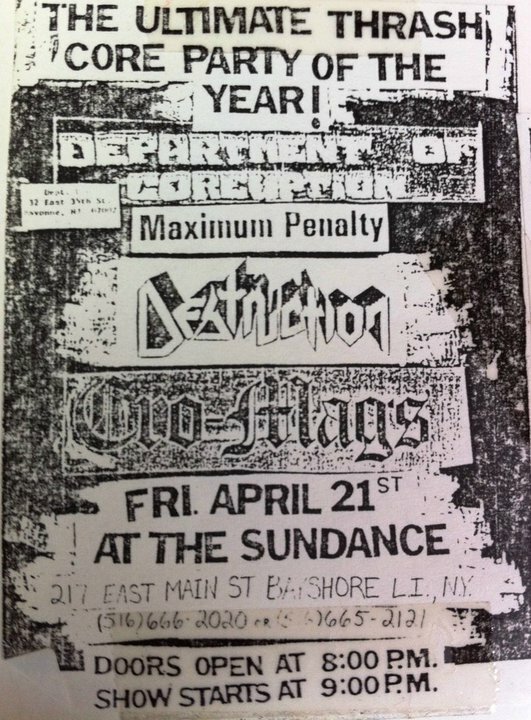 opening for Cro-Mags, with Maximum Penalty. 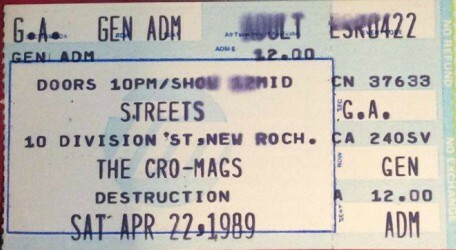 22/04/1989; Concert at Streets, New Rochelle, NY, USA. with Cro-Mags. 23/04/1989; Concert at The Chance, Poughkeepsie, NY, USA. 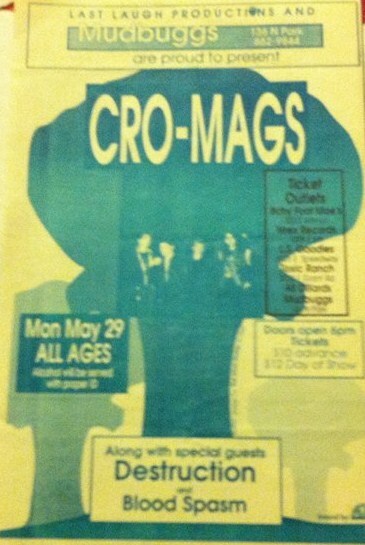 opening for Cro-Mags. 24/04/1989; Concert at The 9:30 Club, Washington, DC, USA. 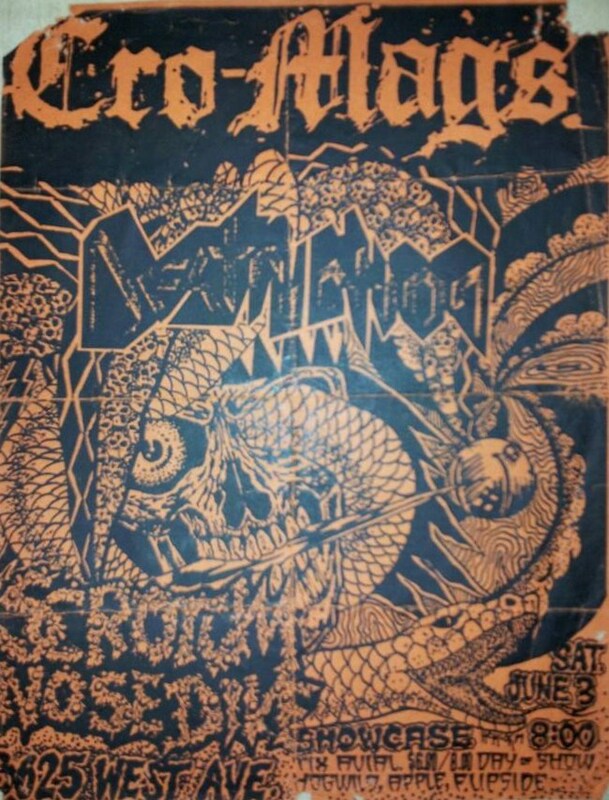 opening for Cro-Mags. 25/04/1989; Concert at The 9:30 Club, Washington, DC, USA. 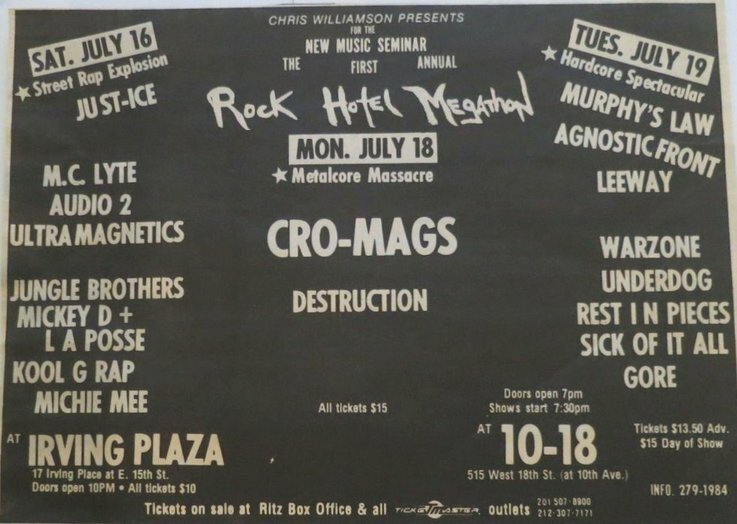 opening for Cro-Mags. 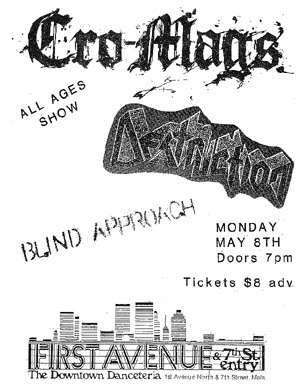 26/04/1989; Concert at City Limits, Pittsburgh, PA, USA. 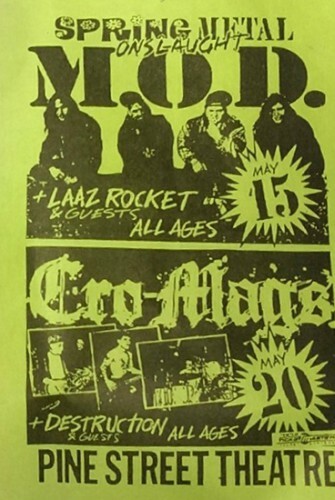 opening for Cro-Mags. 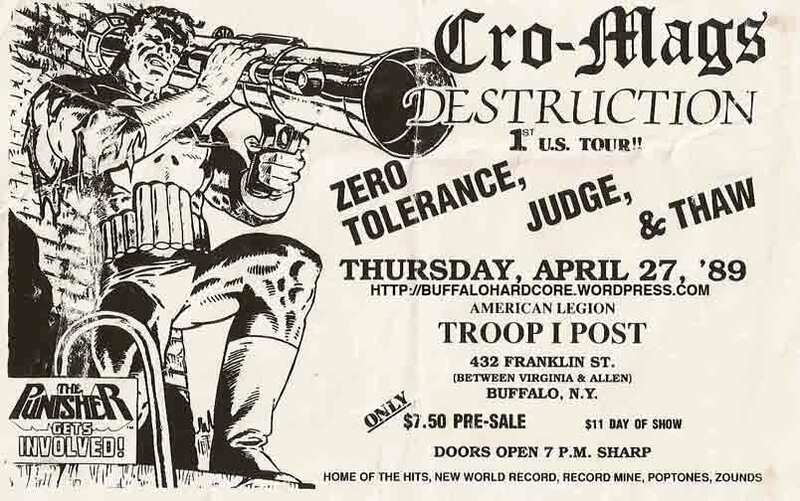 27/04/1989; Concert at Troop I Post, Buffalo, NY, USA. 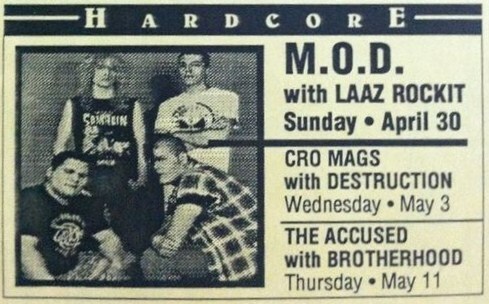 opening for Cro-Mags. 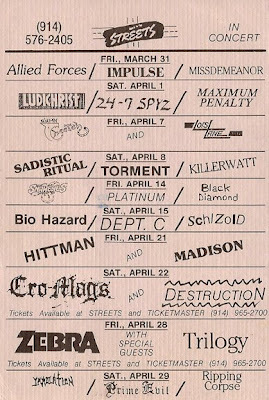 29/04/1989; Concert at The Lost Horizon, Syracuse, NY, USA. 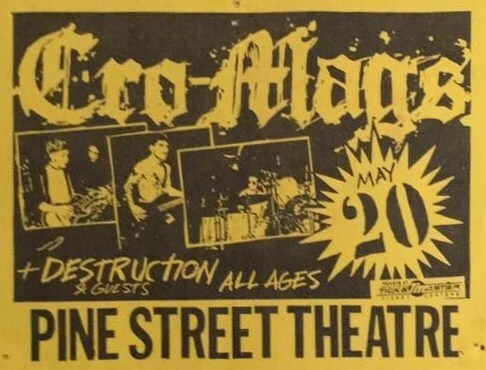 opening for Cro-Mags. 30/04/1989; Concert at The Siboney, Toronto, ON, Canada. 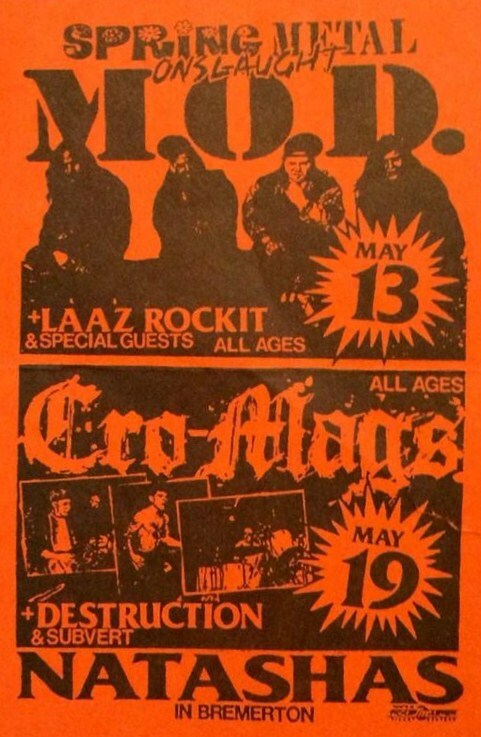 opening for Cro-Mags. 02/05/1989; Concert at The Phantasy Theatre, Lakewood, OH, USA. 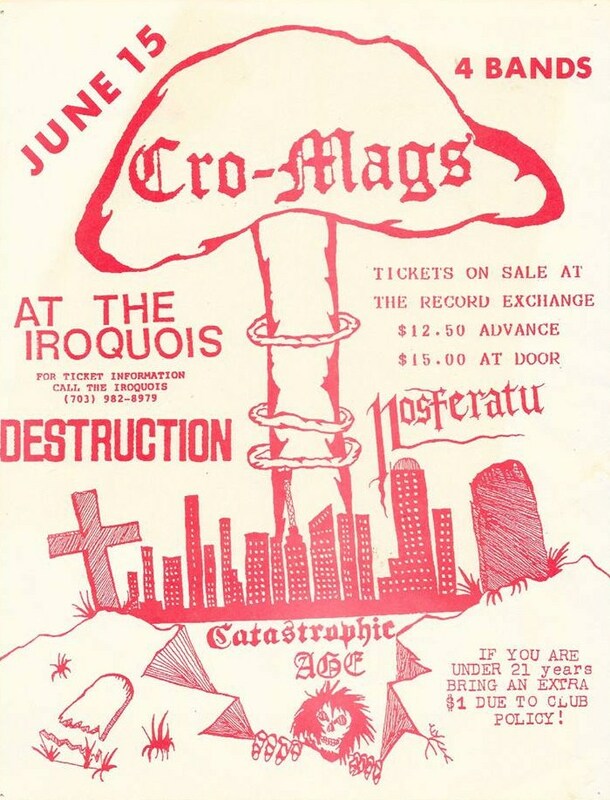 opening for Cro-Mags. 03/05/1989; Concert at Bogart's, Cincinnati, OH, USA. 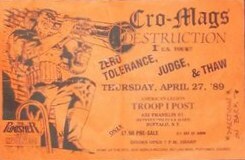 opening for Cro-Mags. 05/05/1989; Concert at Blondie's, Detroit, MI, USA. 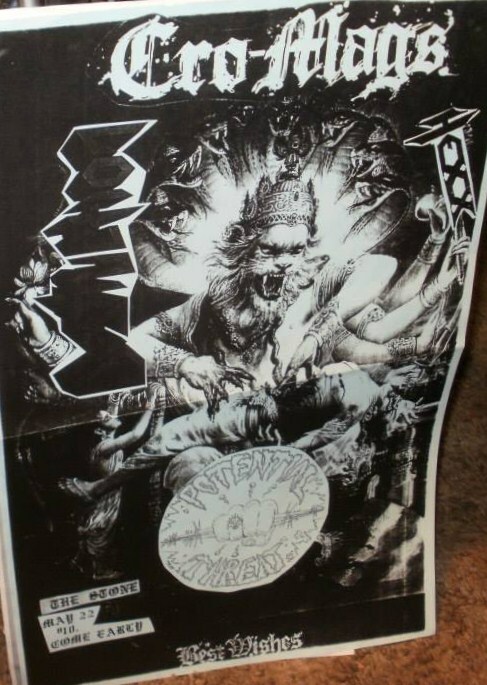 opening for Cro-Mags. 06/05/1989; Concert at The Omnibus, Milwaukee, WI, USA. 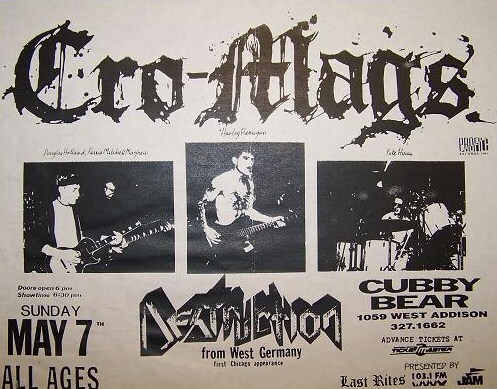 opening for Cro-Mags. 07/05/1989; Concert at The Cubby Bear, Chicago, IL, USA. 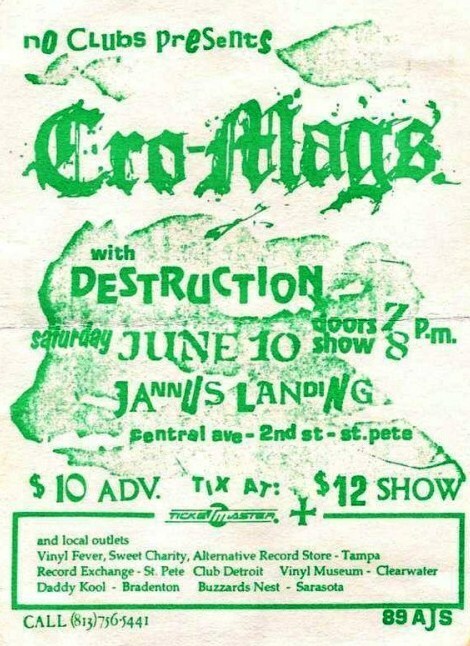 opening for Cro-Mags. 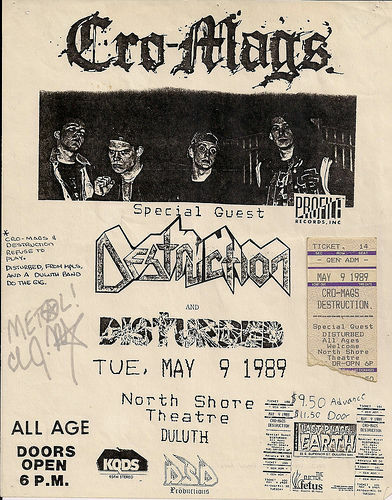 08/05/1989; Concert at First Avenue, Minneapolis, MN, USA. 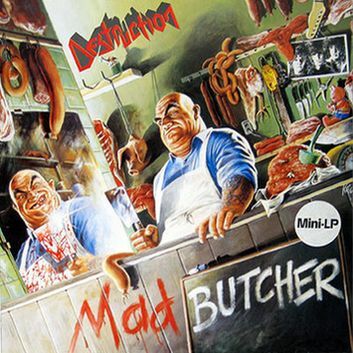 with Cro-Mags & Blind Approach. 09/05/1989; Concert at The North Shore Theatre, Duluth, MN, USA. 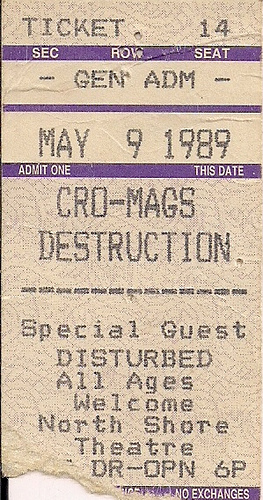 with Cro-Mags & Disturbed. 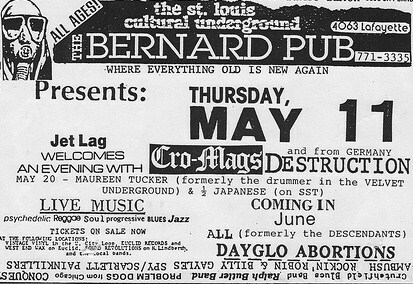 11/05/1989; Concert at The Bernard Pub, St. Louis, MO, USA. 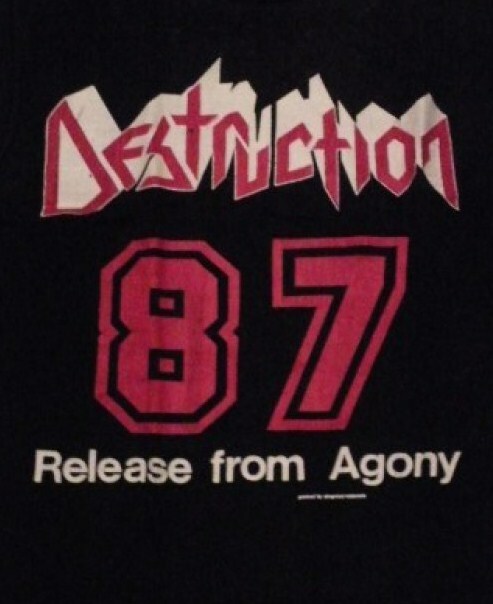 with Cro-Mags & Dayglo Abortions. 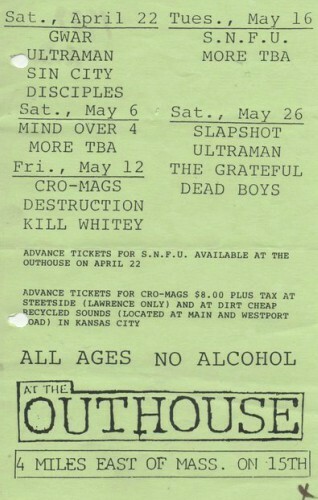 12/05/1989; Concert at The Outhouse, Lawrence, KS, USA. 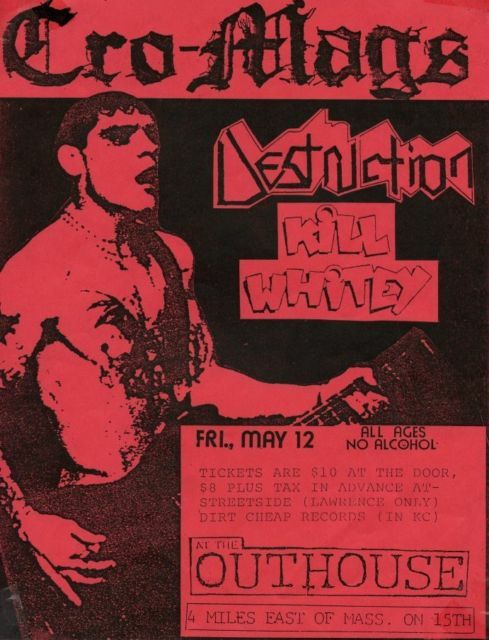 with Cro-Mags & Kill Whitey. 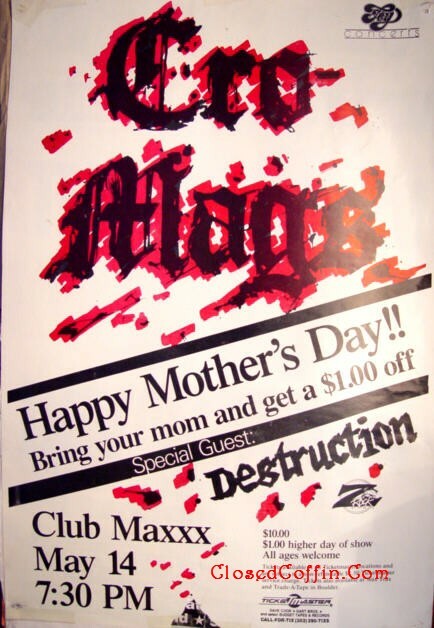 14/05/1989; Concert at Club Maxxx, Denver, CO, USA. 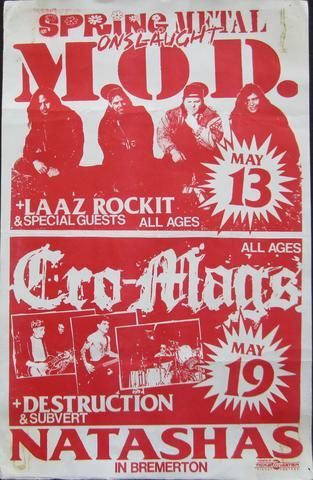 with Cro-Mags. 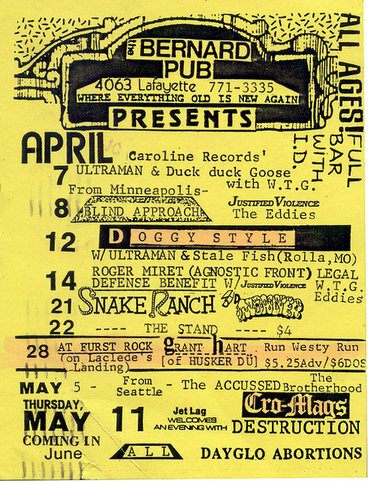 16/05/1989; Concert at The Speedway Cafe, Salt Lake City, UT, USA. opening for Cro-Mags, with Insight. 18/05/1989; Concert at The York Theatre, Vancouver, BC, Canada. 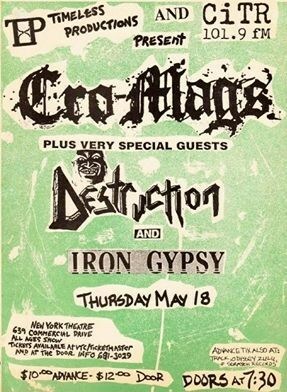 opening for Cro-Mags, with Iron Gypsy. 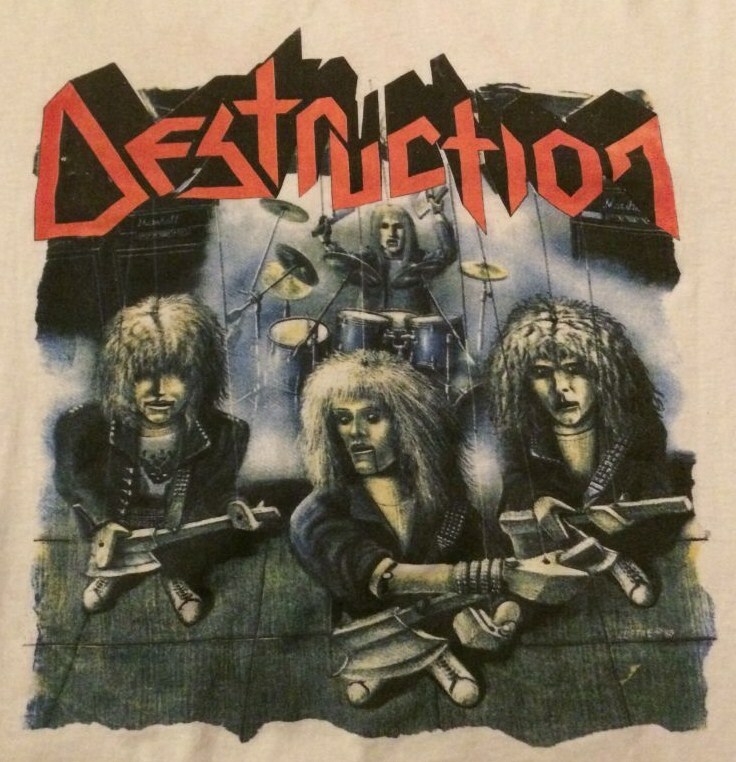 19/05/1989; Concert at Natasha's, Bremerton, WA, USA. 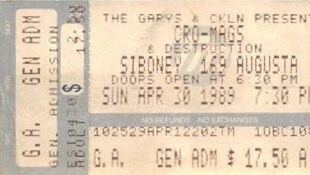 opening for Cro-Mags, with Subvert. 20/05/1989; Concert at The Pine Street Theatre, Portland, OR, USA. with Cro-Mags. 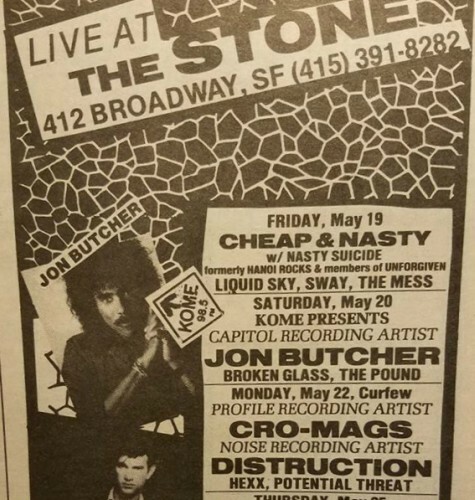 22/05/1989; Concert at The Stone, San Francisco, CA, USA. 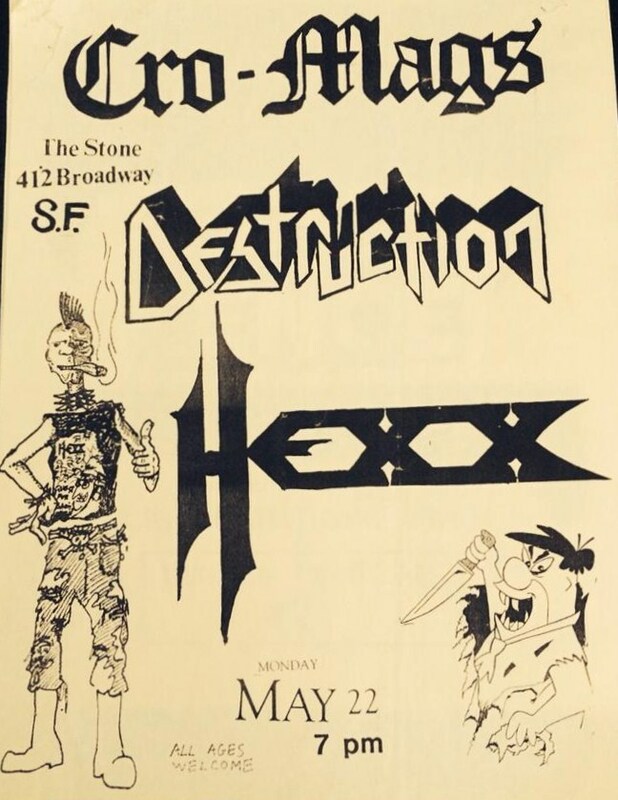 opening for Cro-Mags, with Hexx & Potential Threat. 23/05/1989; Concert at The Graduate, Isla Vista, CA, USA. 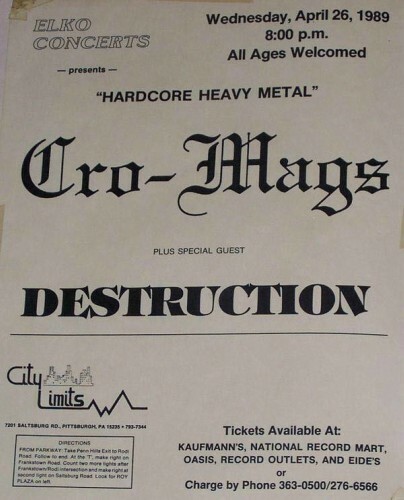 opening for Cro-Mags. 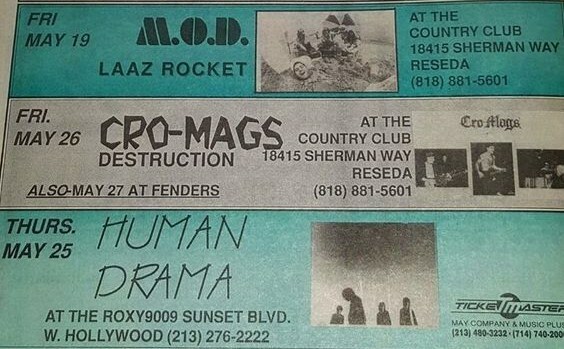 25/05/1989; Concert at Monopoly's, Riverside, CA, USA. 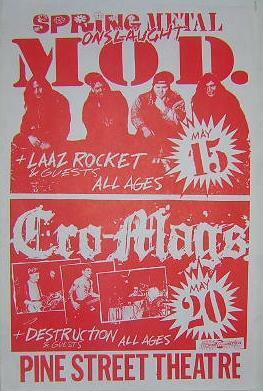 opening for Cro-Mags. 26/05/1989; Concert at The Country Club, Reseda, CA, USA. 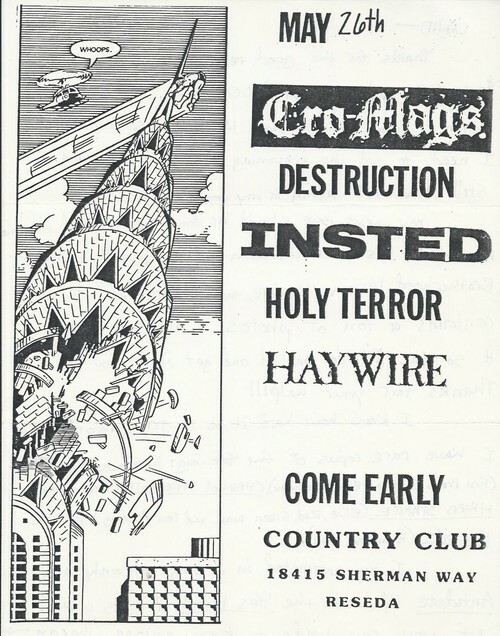 opening for Cro-Mags, with Insted & asst. 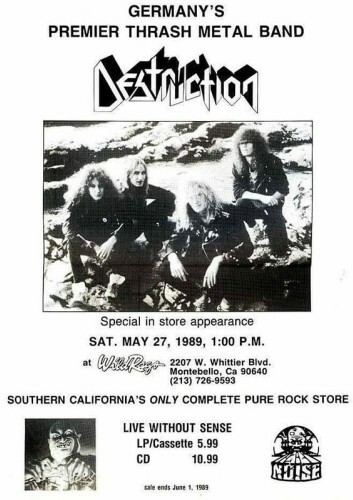 ​27/05/1989; In-Store-Appearance at 'Wild Rags' records, Montebello, CA, USA. 27/05/1989; Concert at Fenders Ballroom, Long Beach, CA, USA. 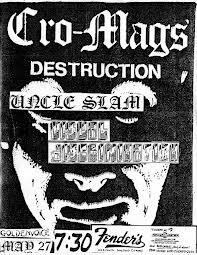 with Cro-Mags, Uncle Slam & Visual Discrimination. 29/05/1989; Concert at Mudbuggs, Tucson, AZ, USA. 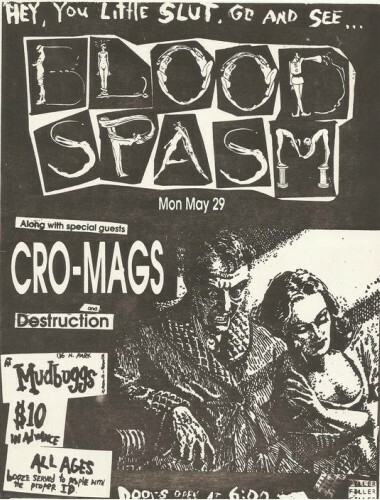 with Cro-Mags & Blood Spasm. 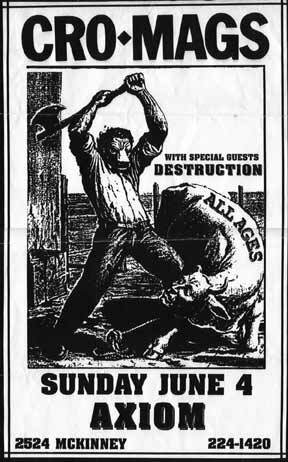 31/05/1989; Concert at The Stardust Ballroom, Corpus Christi, TX, USA. 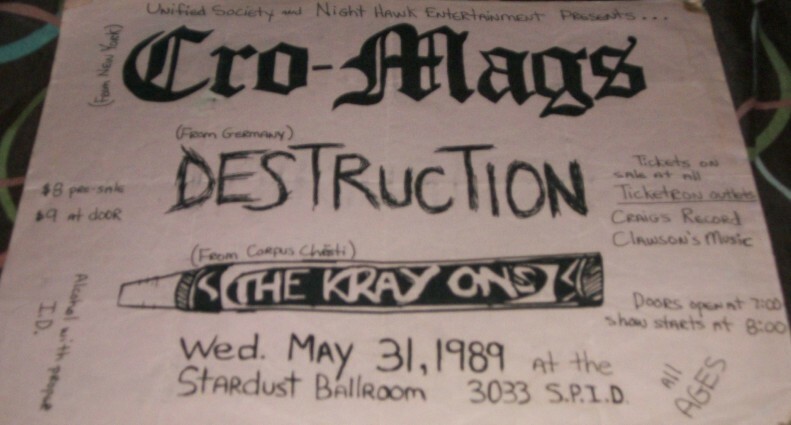 opening for Cro-Mags, with The Kray Ons. 01/06/1989; Concert at The Backroom, Austin, TX, USA. 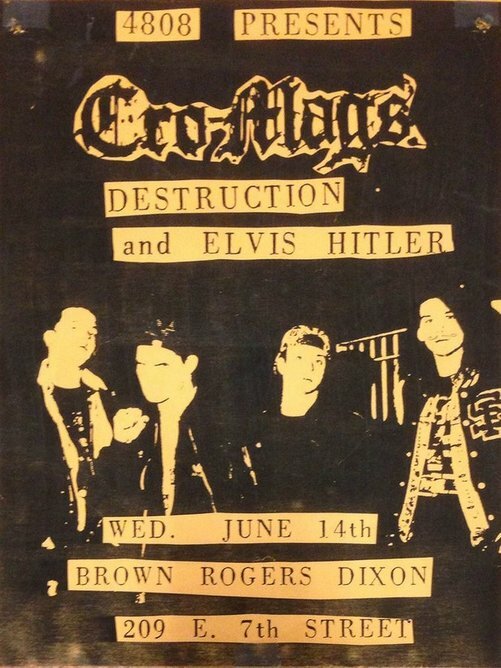 opening for Cro-Mags. 03/06/1989; Concert at The Showcase, San Antonio, TX, USA. 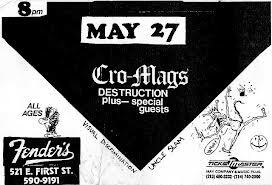 with Cro-Mags. & Scrotum Nosedive. 04/06/1989; Concert at The Axiom, Houston, TX, USA. with Cro-Mags. 05/06/1989; Concert at American Jefferson Legion Post 267, New Orleans, LA, USA. 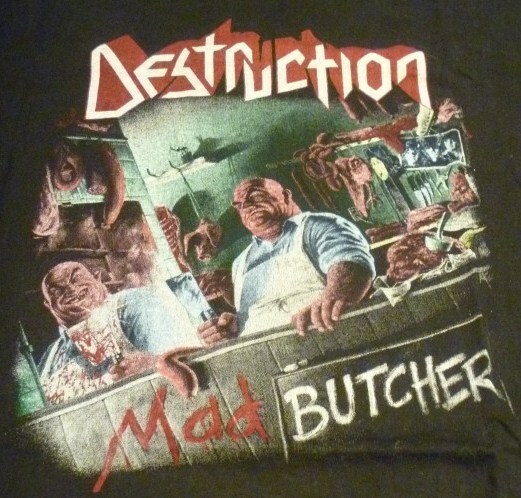 with Cro-Mags Aftershock & Mad Dog. 06/06/1989; Concert at The 631 Club, Memphis, TN, USA. 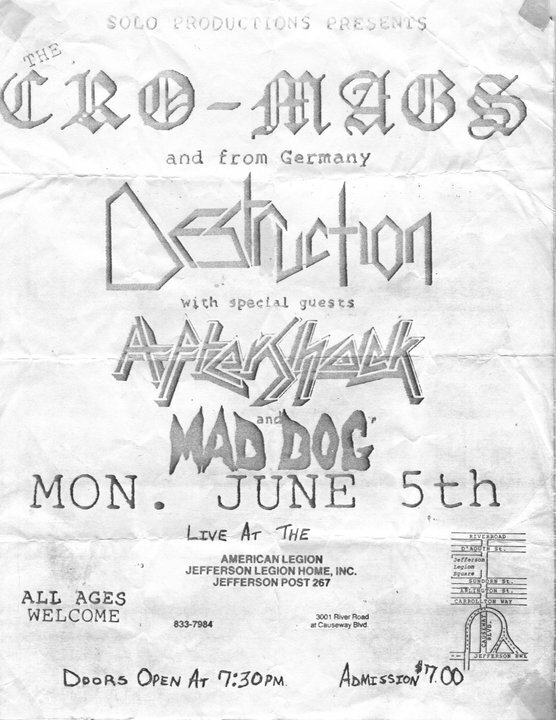 with Cro-Mags. 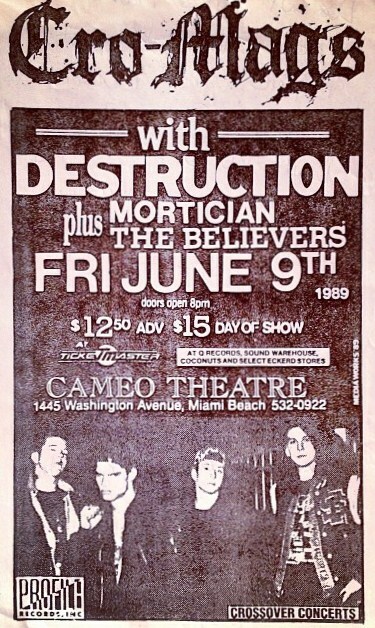 09/06/1989; Concert at The Cameo Theatre, Miami Beach, FL, USA. 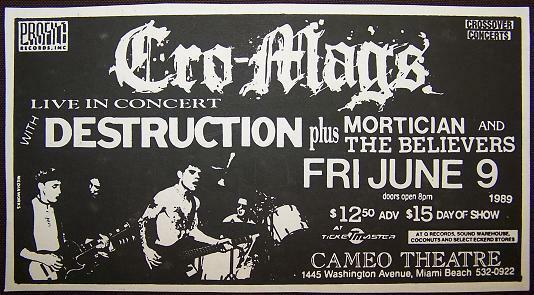 with Cro-Mags, Mortician & The Believers. 10/06/1989; Concert at Jannus Landing, St. Petersburg, FL, USA. with Cro-Mags. 11/06/1989; Concert at Club 2225, Melbourne, FL, USA. 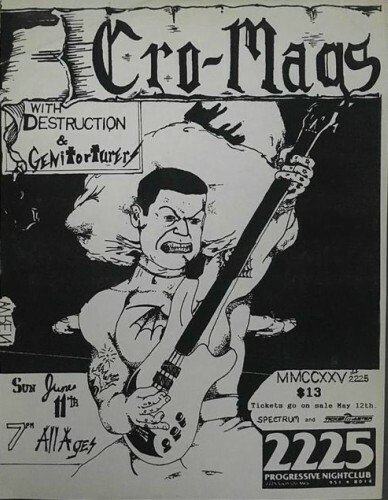 with Cro-Mags & Genitorturers. 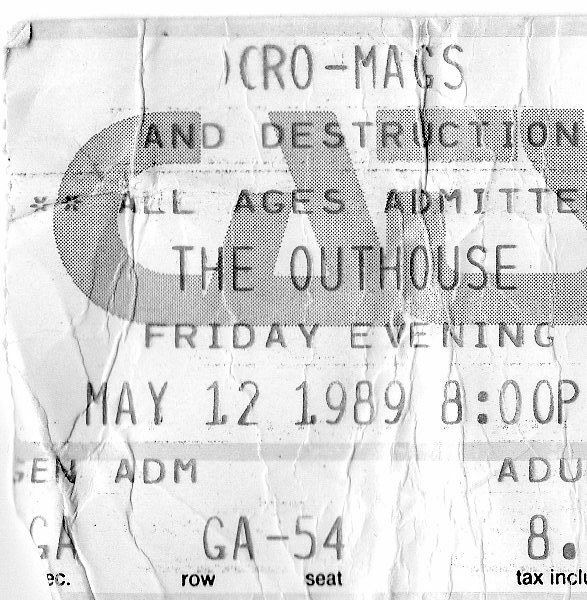 12/06/1989; Concert at The Metroplex, Atlanta, GA, USA. 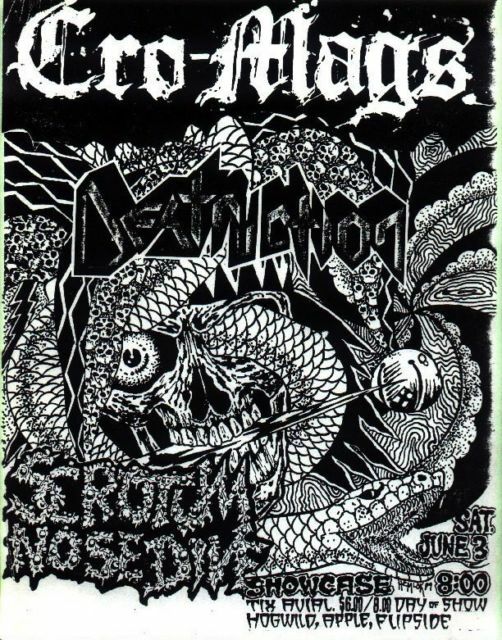 opening for Cro-Mags, with Argonne Forest. 13/06/1989; Concert at The Brewery, Raleigh, NC, USA. 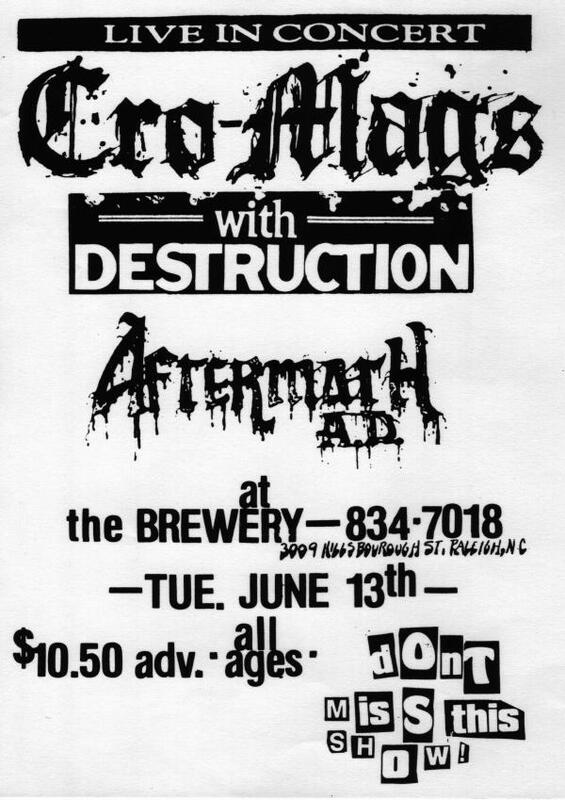 with Cro-Mags & Aftermath A.D.
14/06/1989; Concert at Central Ave, Charlotte, NC, USA. 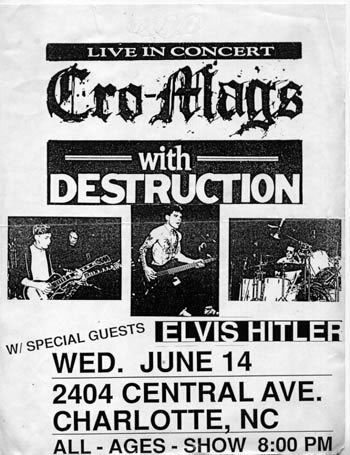 with Cro-Mags & Elvis Hitler. 15/06/1989; Concert at The Iroquois, Roanoke, VA, USA. 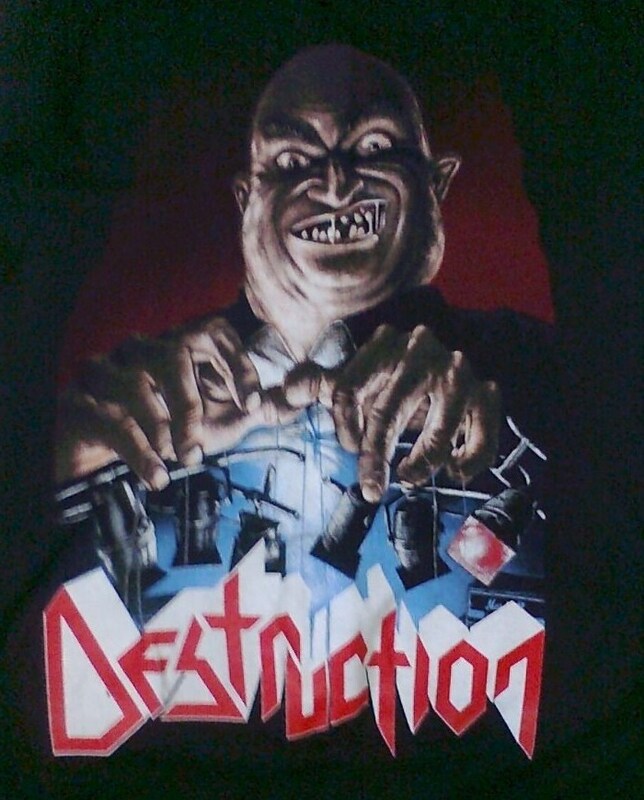 with Cro-Mags & Nosferatu. 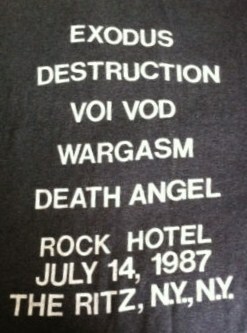 17/06/1989; Concert at The Rock Hotel, New York, NY, USA. 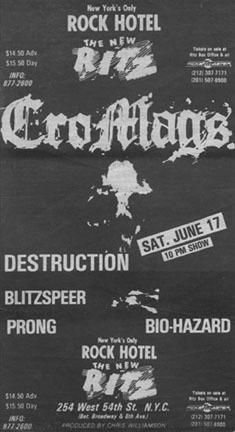 with Cro-Mags, Blitzspeer, Prong & Bio Hazard. 18/06/1989; Concert at The Paradise, Boston, MA, USA. 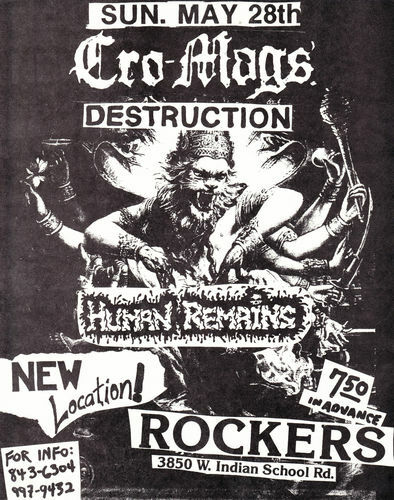 with Cro-Mags. 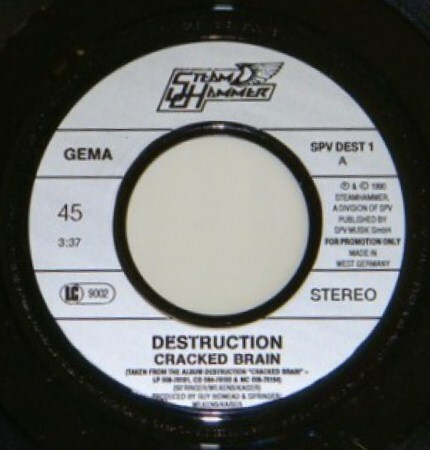 (possibly cancelled, played 19/04). 21/06/1989; Concert at City Limits, Pittsburgh, PA, USA. 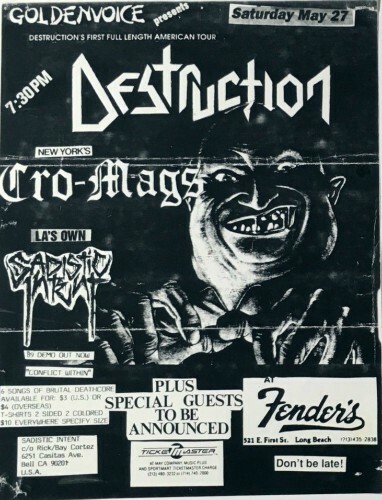 with Cro-Mags. 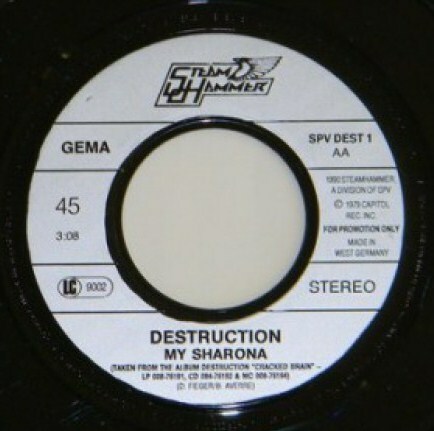 (possibly cancelled, played 26/04). 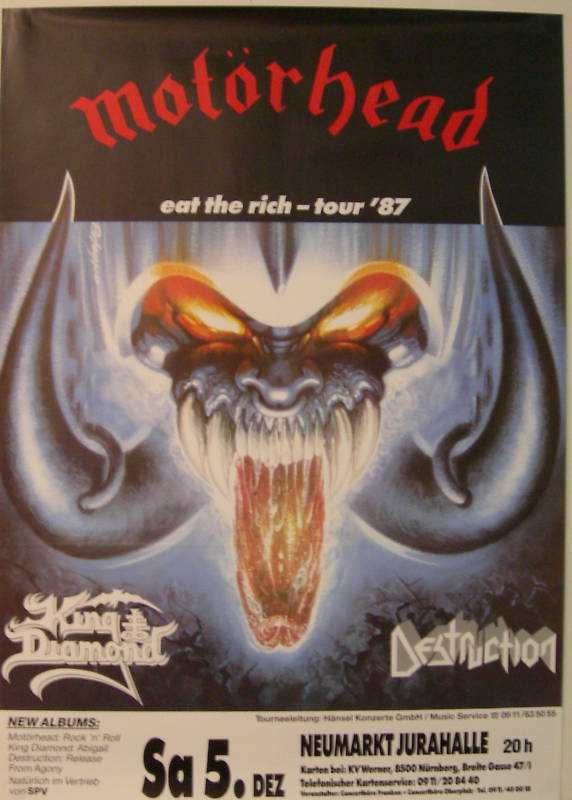 24/06/1989; Concert at The Anthrax, Norwalk, CT, USA. 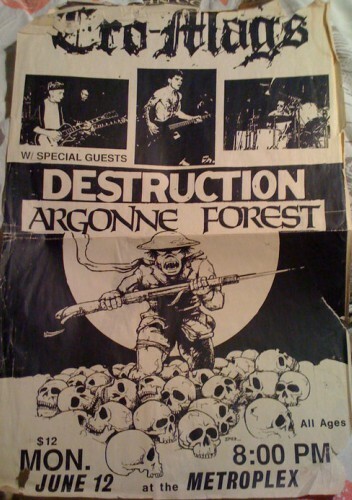 with Cro-Mags & Lost Generation. 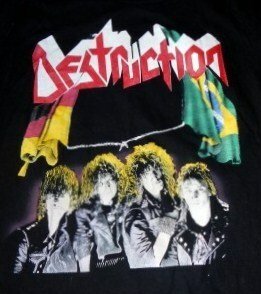 12/08/1989; Concert at Projeto Leste 1, Sao Paulo, Brazil. with Korzus. 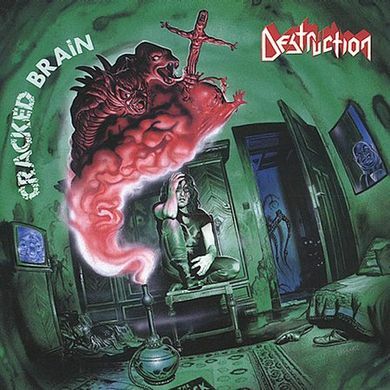 01/06/1990; 'Cracked Brain' album released. 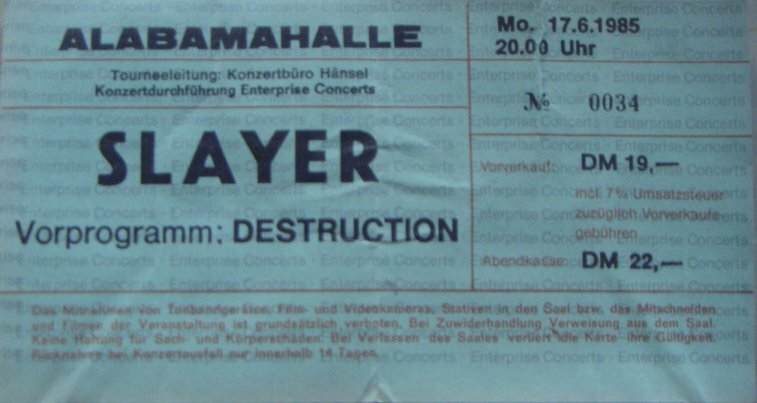 19/01/1991; Concert at Halle Gartlage, Osnabruck, Germany. 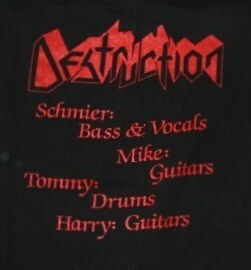 opening for Sodom, with Accuser. (Jan. 19th - Feb. 28th; 'Better Off Dead' tour). 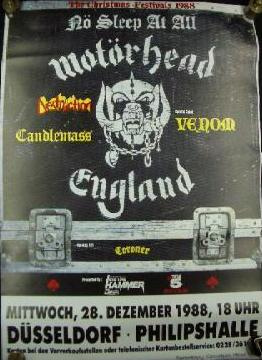 20/01/1991; Concert at The Aladdin, Bremen, Germany. 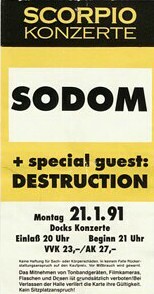 opening for Sodom. 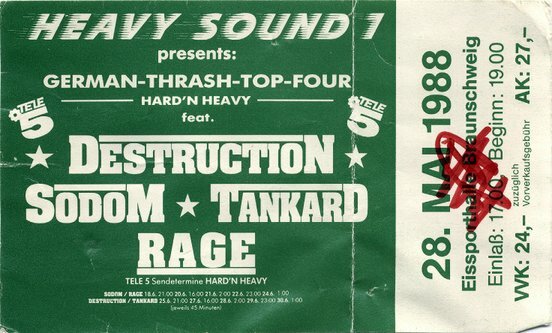 21/01/1991; Concert at The Dock's, Hamburg, Germany. 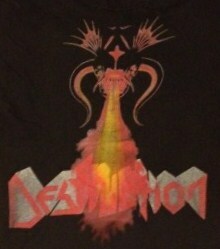 opening for Sodom. 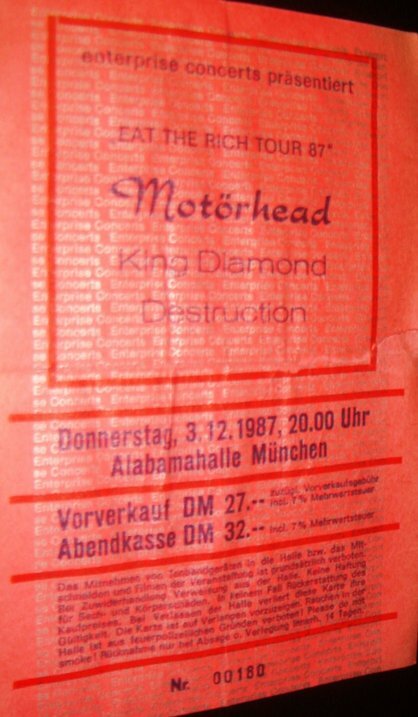 22/01/1991; Concert at Neue Welt, Berlin, Germany. 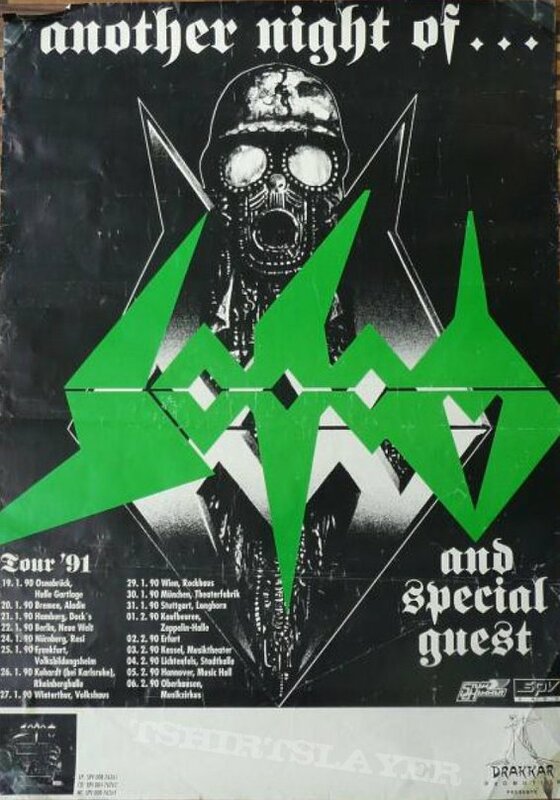 opening for Sodom. 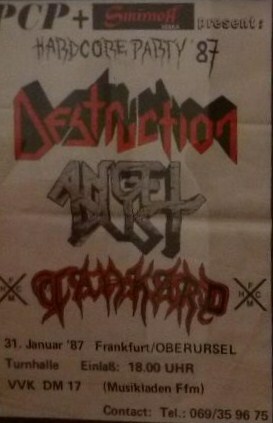 24/01/1991; Concert at Resi, Nuremberg, Germany. opening for Sodom. 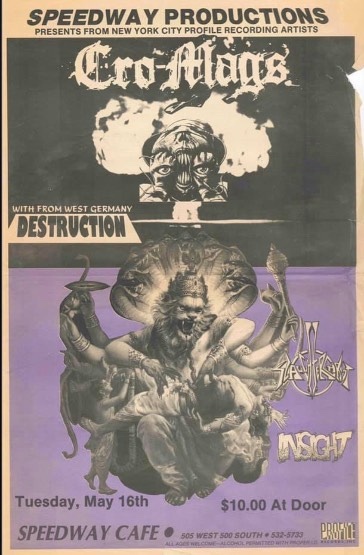 25/01/1991; Concert at Volksbildunhgheim, Frankfurt, Germany. opening for Sodom. 26/01/1991; Concert at Haus Der Jugend, Ludwigshafen, Germany. 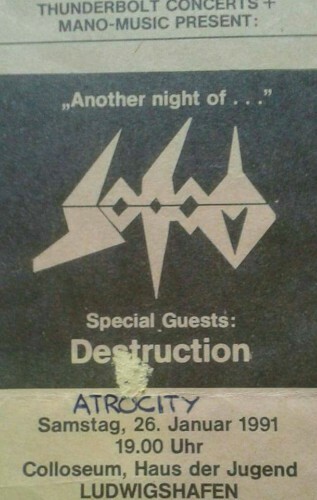 opening for Sodom, with Atrocity. 27/01/1991; Concert at Volkshaus, Winterthur, Switzerland. opening for Sodom. 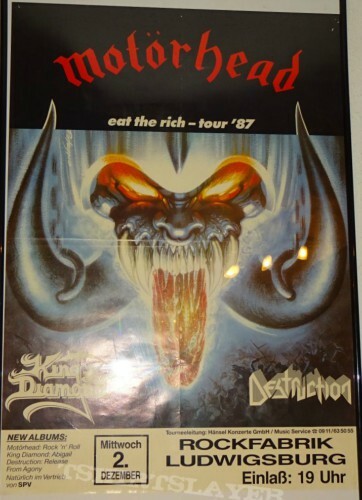 29/01/1991; Concert at Rockhaus, Vienna, Austria. 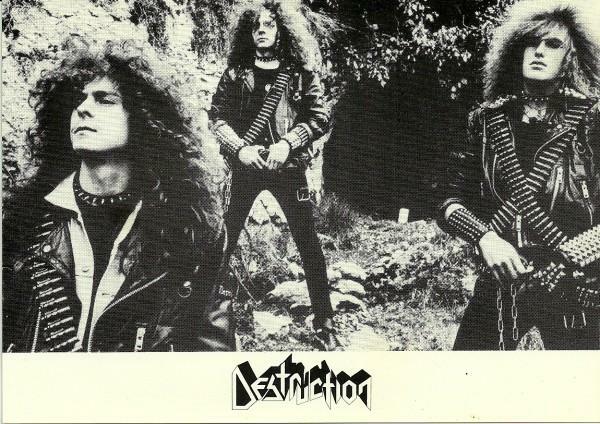 opening for Sodom. 30/01/1991; Concert at Theaterfabric, Munich, Germany. opening for Sodom. 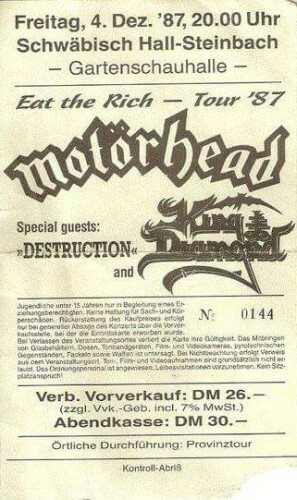 31/01/1991; Concert at Longhorn, Stuttgart, Germany. opening for Sodom. 01/02/1991; Concert at Zeppelin-Halle, Kaubeuren, Germany. opening for Sodom. 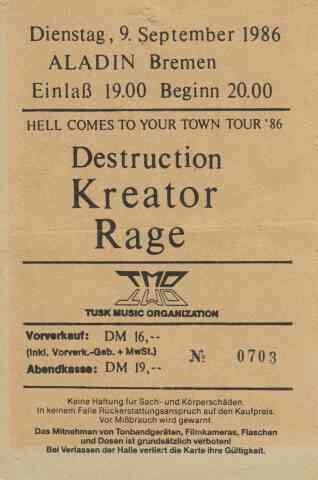 03/02/1991; Concert at Musictheatre, Kassel, Germany. opening for Sodom. 04/02/1991; Concert at Stadhalle, Lichtenfels, Germany. opening for Sodom. 05/02/1991; Concert at Music Hall, Hannover, Germany. opening for Sodom. 06/02/1991; Concert at Music Circus Ruhr, Oberhausen, Germany. opening for Sodom. 08/02/1991; Concert at Zaal Unitas, Brunnsum, Germany. 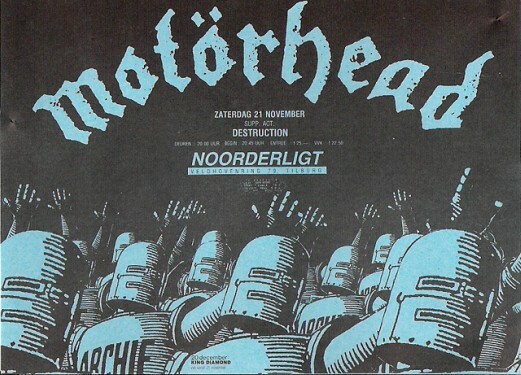 09/02/1991; Concert at Noorderligt, Tilburg, The Netherlands. 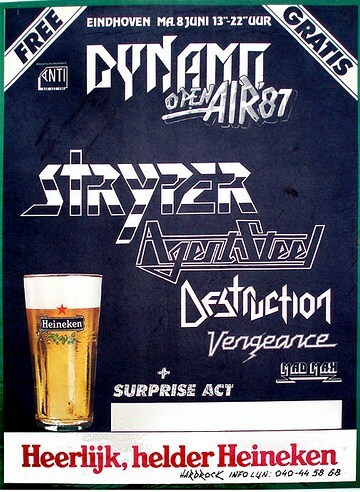 10/02/1991; Concert at Zaal Pede, Lievenshoutem, Belgium. 13/02/1991; Concert at The Marquee, London, England. opening for Sodom. 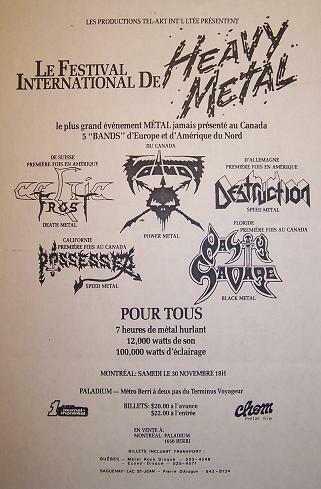 14/02/1991; Concert at Espace Onano, Paris, France. 15/02/1991; Concert at ??, ? ?, Scandinavia. 16/02/1991; Concert at ??, ? ?, Scandinavia. 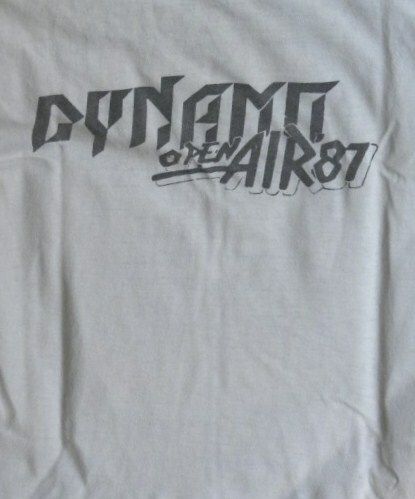 17/02/1991; Concert at ??, ? ?, Scandinavia. 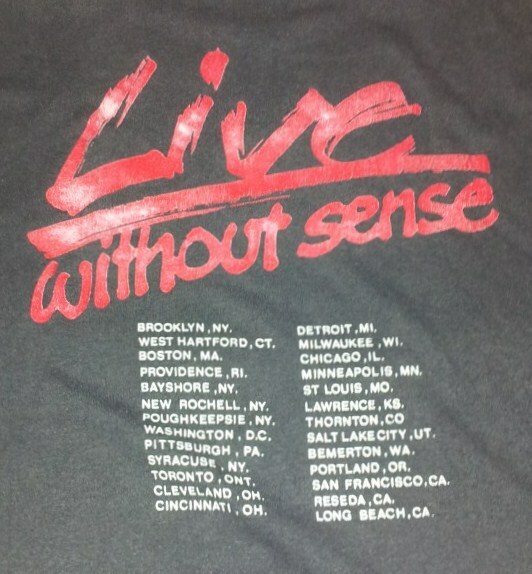 18/02/1991; Concert at ??, ? ?, Scandinavia. 19/02/1991; Concert at ??, ? ?, Scandinavia. 20/02/1991; Concert at ??, ? ?, Scandinavia. 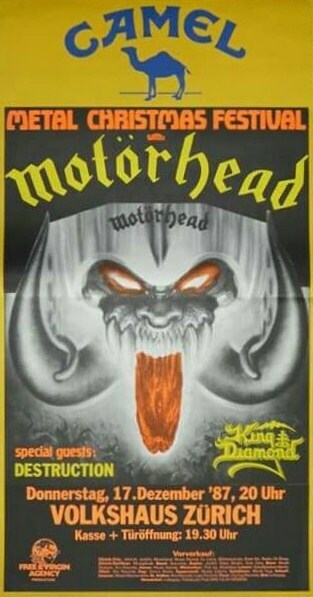 22/02/1991; Concert at ? ?, Prague, Chechoslovakia. 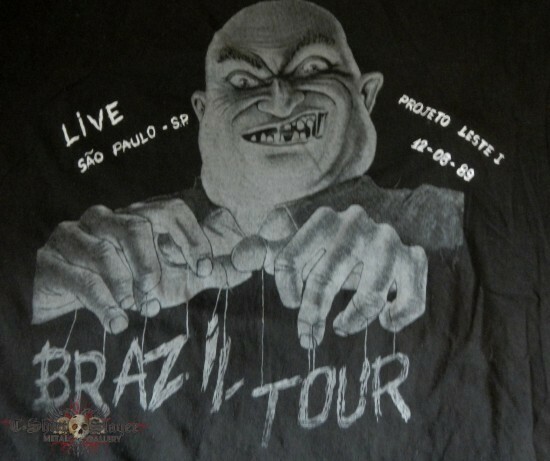 23/02/1991; Concert at ? ?, Ostrava, Chechoslovakia. 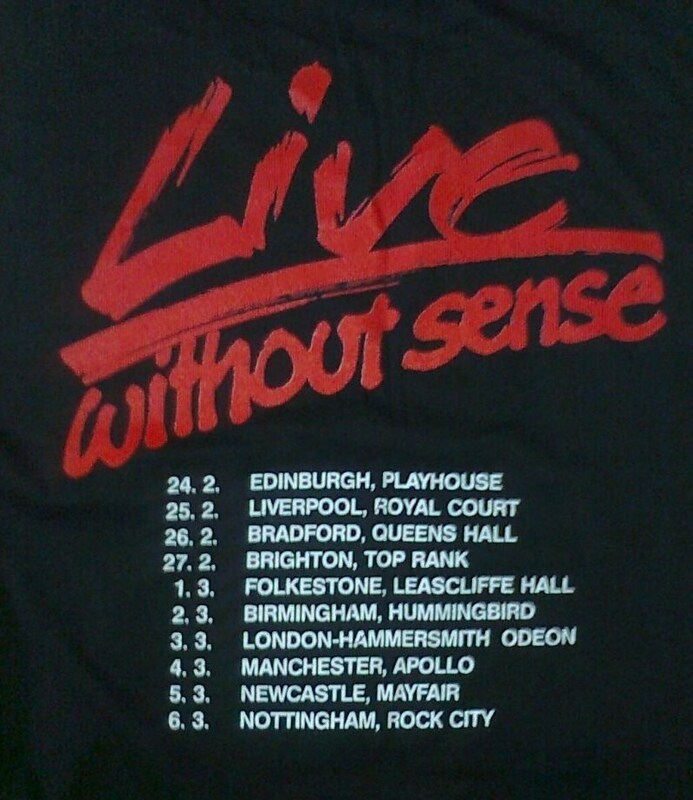 25/02/1991; Concert at ??, ? ?, Yugoslavia. 27/02/1991; Concert at ??, ? ?, Greece. 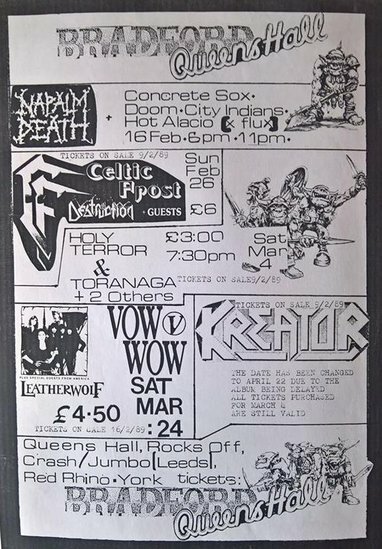 28/02/1991; Concert at ??, ? ?, Greece. 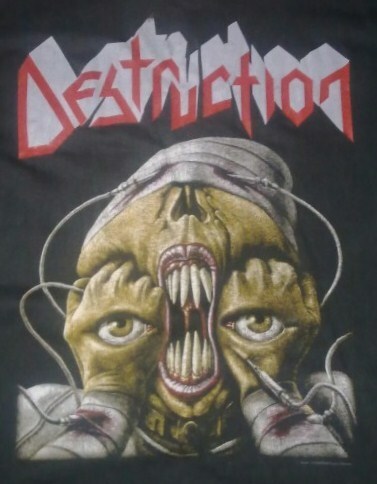 Destruction version 3.0 - 210 entries - 297 images - 21/07/2018.